Apparently, it’s the coldest March for fifty years and it definately feels like it. 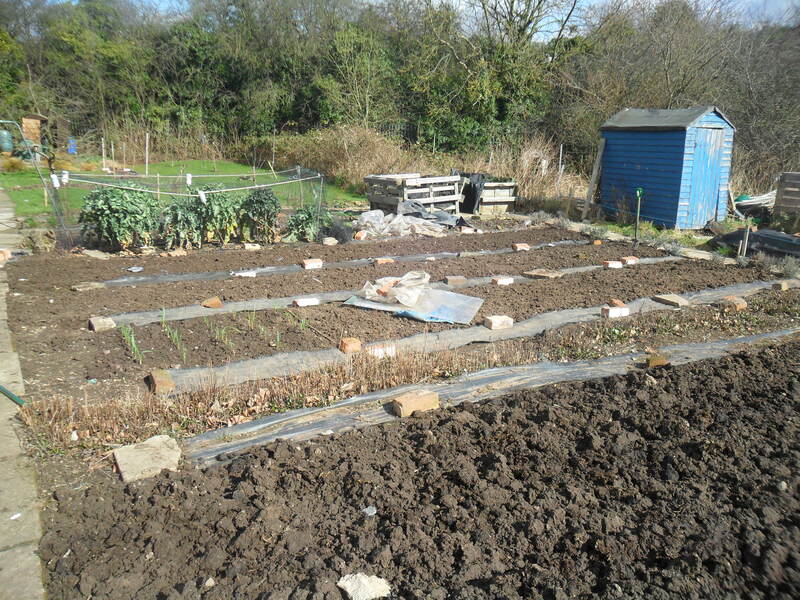 We have been quite lucky here in Leicester as we haven’t had too much snow, but it’s still impossible to work my allotment. 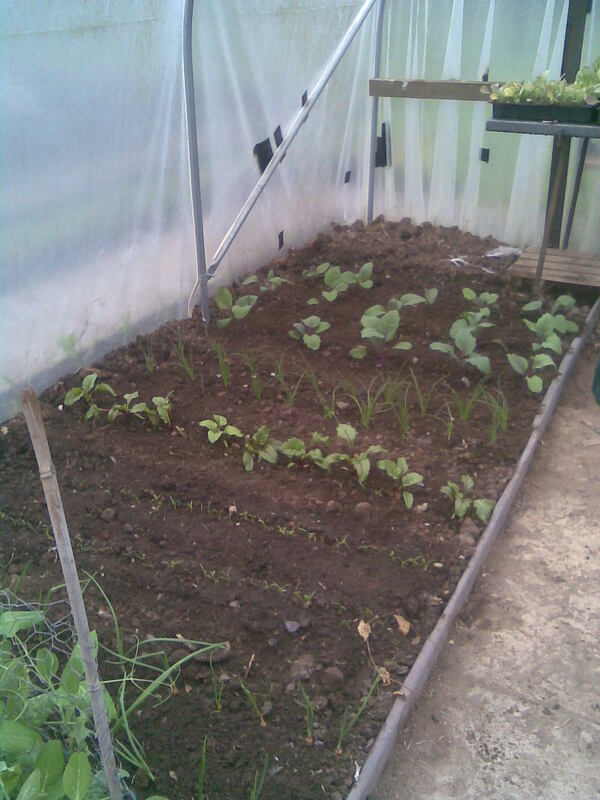 My potatoes and onion sets will just have to wait. 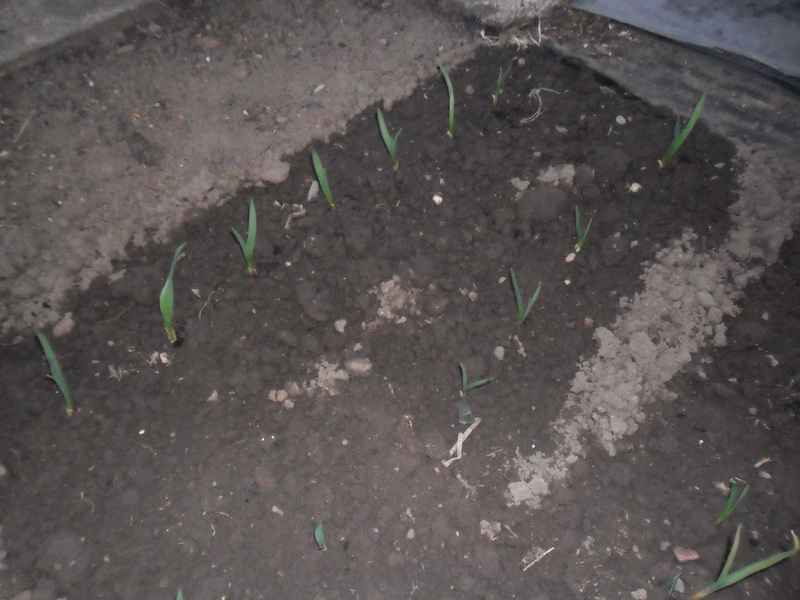 One day I will get my shallots into the ground! 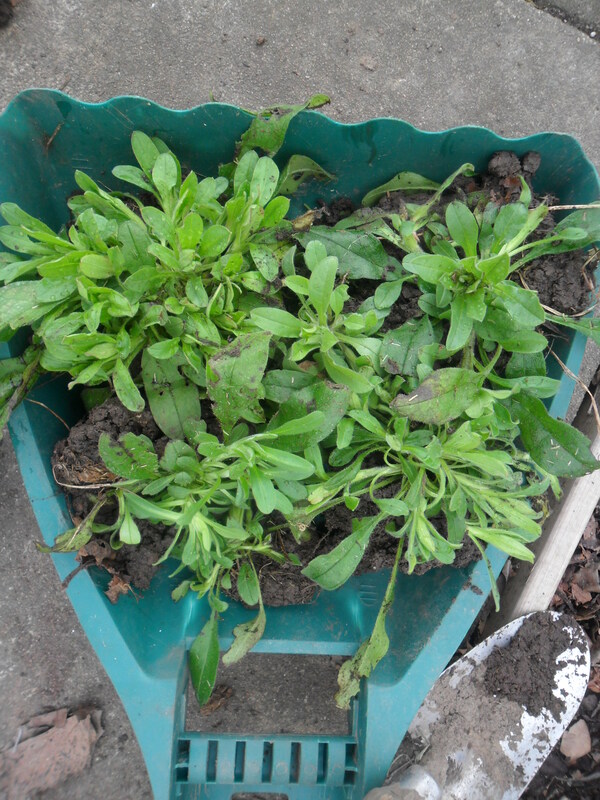 Before it began snowing, I did manage to transplant some ‘Forget-me-nots’ that had ‘self-seeded’ around my allotment. I love ‘Forget-me-nots’ for this exact reason, as they self seed like mad and look so natural around my plot. 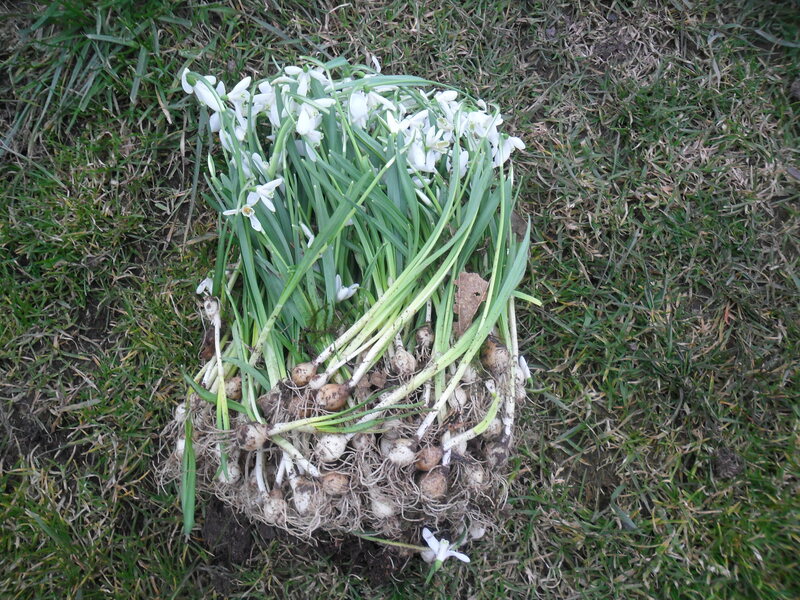 I transplanted the ‘Forget-me-nots’ around my newly planted Snowdrops, that will remind me of my dear friend who sadly passed away in February. 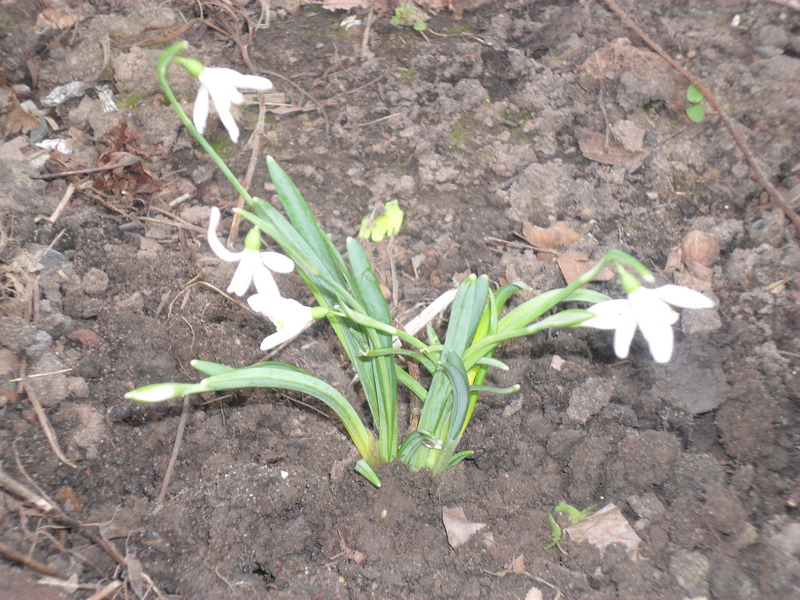 You can read about the snowdrops I planted in my woodland area and why I planted them here. ‘Forget-me-nots’ are lovely, especially in between spring bulbs, so hopefully they will look beautiful in a few years when they have had time to self seed further in this area. The RHS give details of how to grow ‘Forget-me-nots’ here. 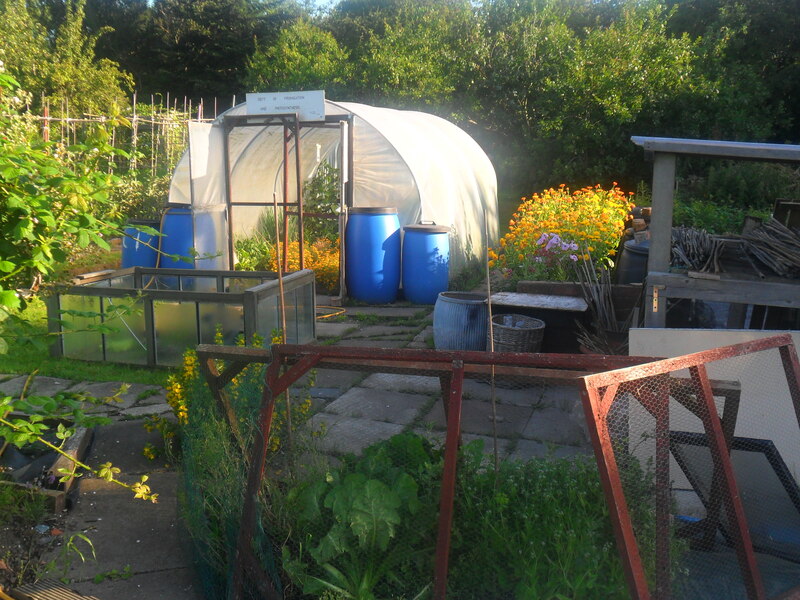 Another job I did manage to do before the snow, was to prune the Buddlia’s and the Lavatera bushes at the back of my plot, behind my ‘hazel’, which incidently I planted a few years ago so I can grow my own pea sticks and bean poles. 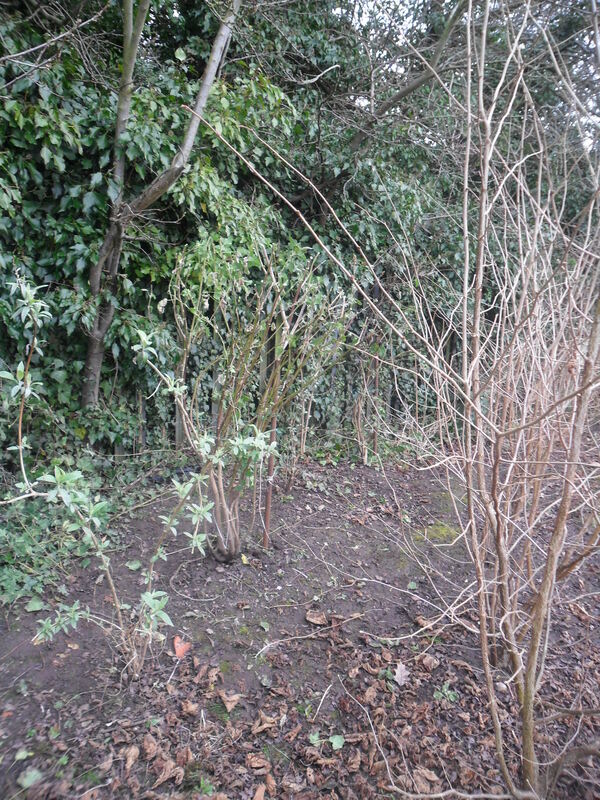 I left the Buddlia’s and the Lavatera bushes quite tall, as they have to compete with the hazel for light. I planted them there for two reasons. The flowers are great for the bees and butterflies and when I cut the hazel down, I will have something pretty to show through. 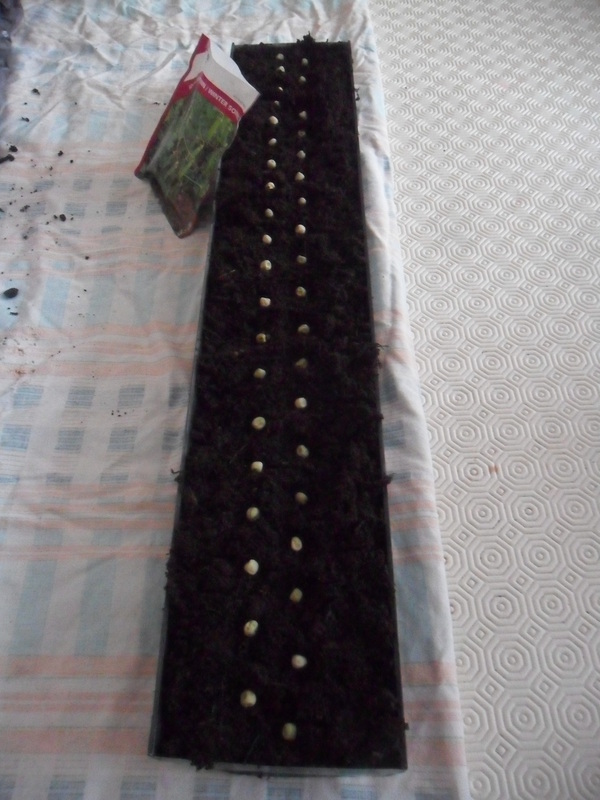 At home, I sowed my first set of peas. 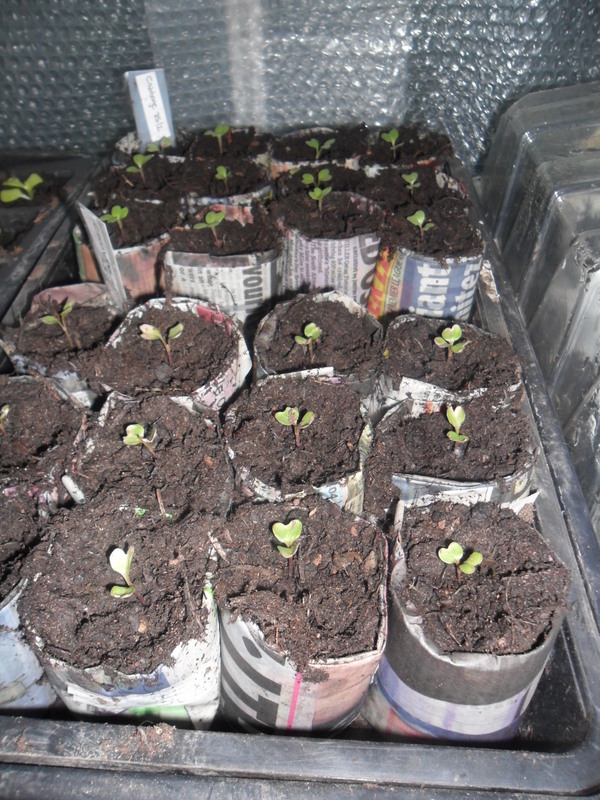 I am a little late sowing them this month but I suppose I’m late doing everything in the garden this year due to the wet weather. 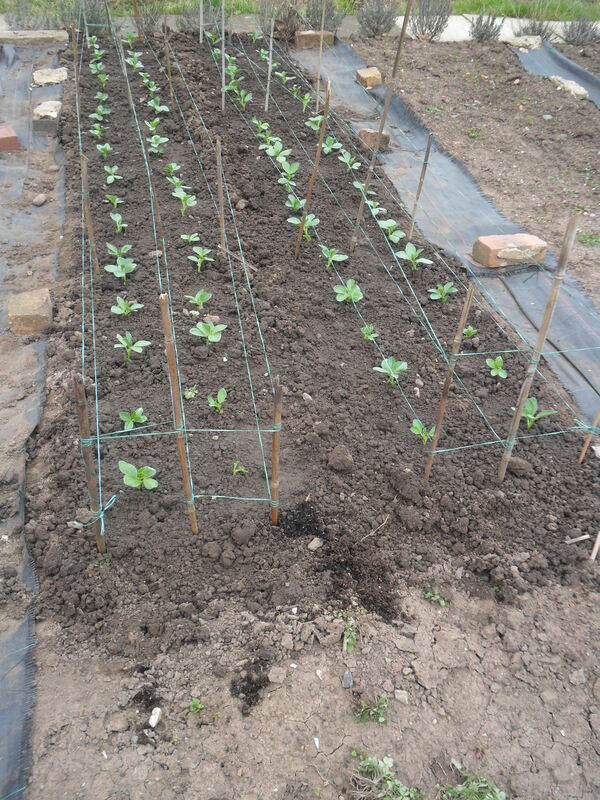 I have tried different ways of sowing my peas, but I find it best to start them off in my greenhouse at home, in small lengths of guttering. 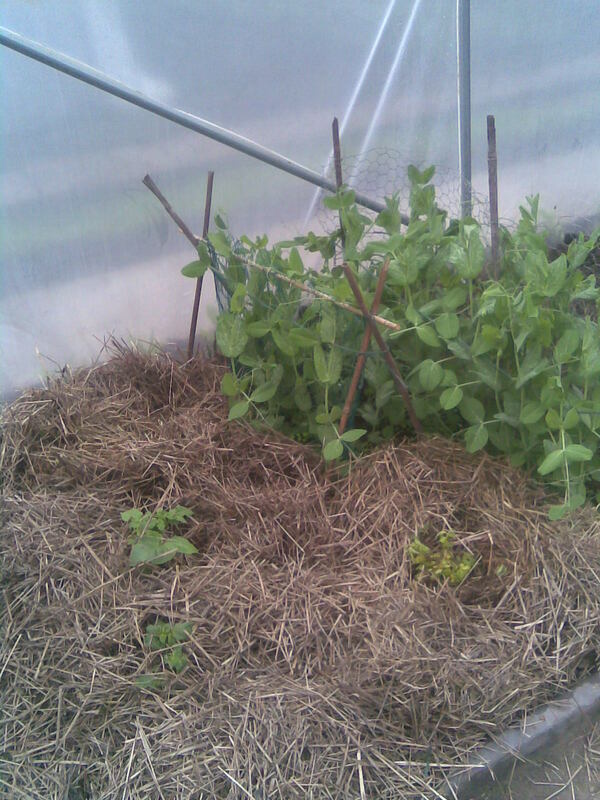 The peas I sowed are a hardy variety called ‘Meteor’ which you can actually sow in Autumn and they will stand over winter under the protection of a cloche. 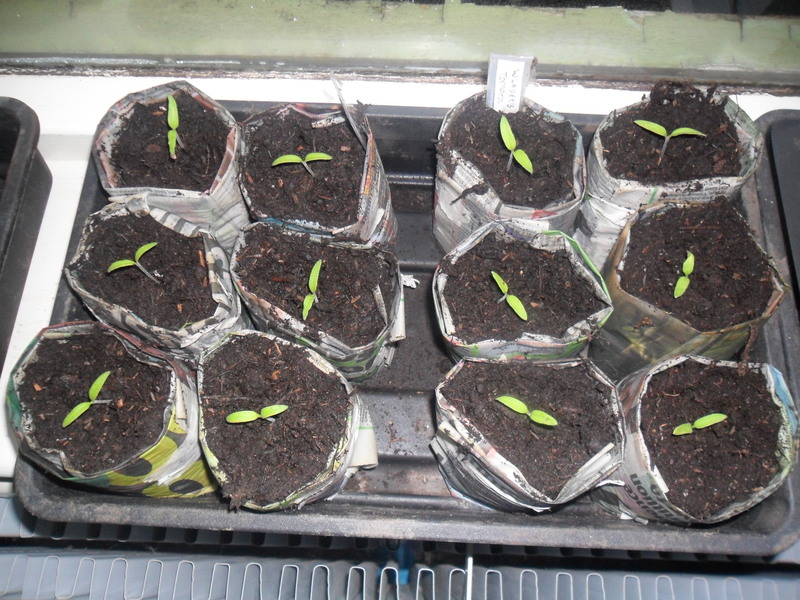 I find it better to sow them this month. Incidentally round, smooth peas are hardier than the wrinkled varieties that are usually sweeter. 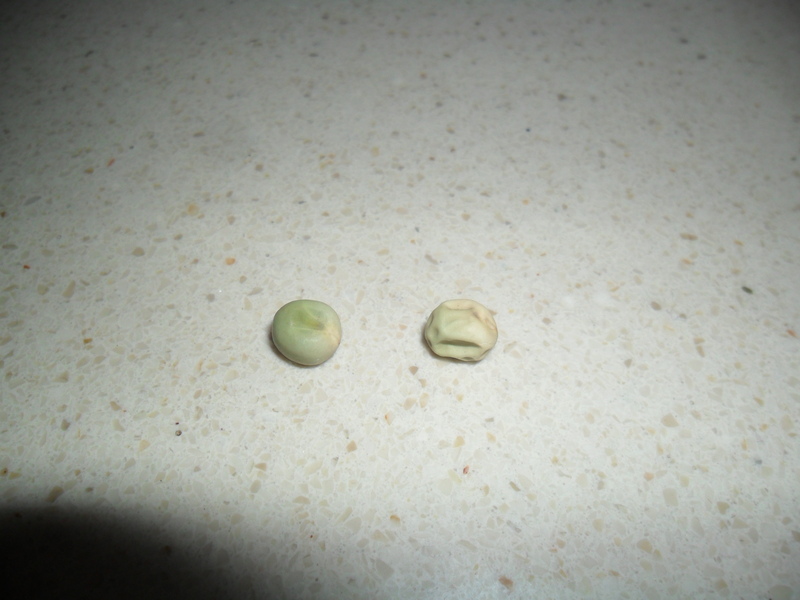 I took a photo of the two types of peas, so you can see the difference. 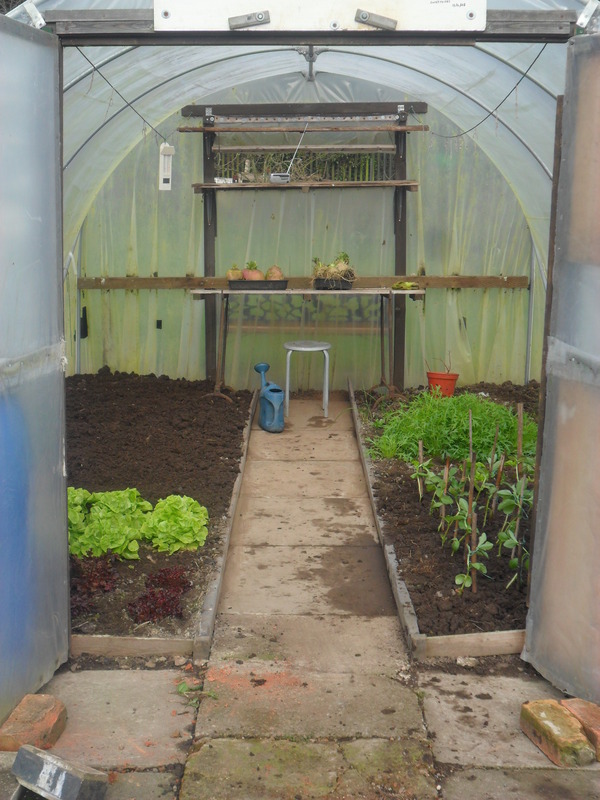 My guttering will sit in my heated greenhouse until I just see them poking throught the compost and then I will move them into my coldframe. 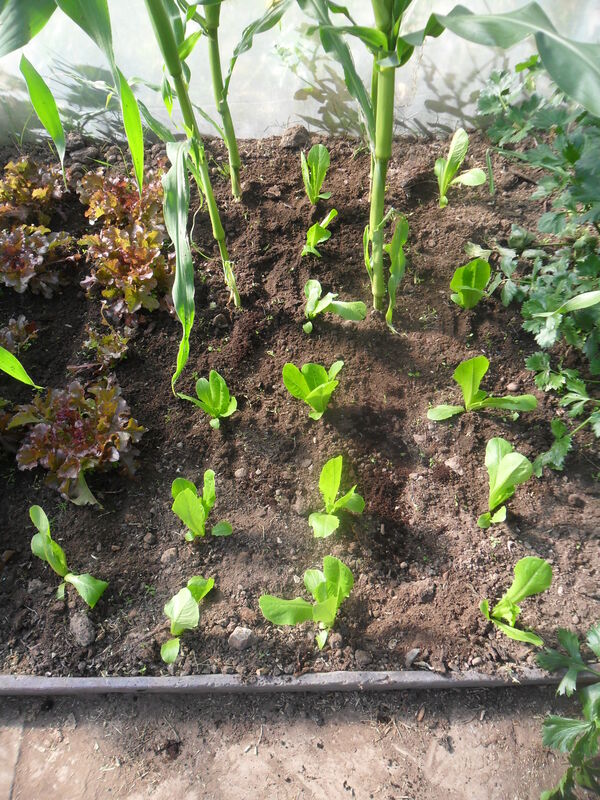 You can read how I plant my peas here. Due to the weather I managed to do a few ‘catch up’ jobs at home this weekend. 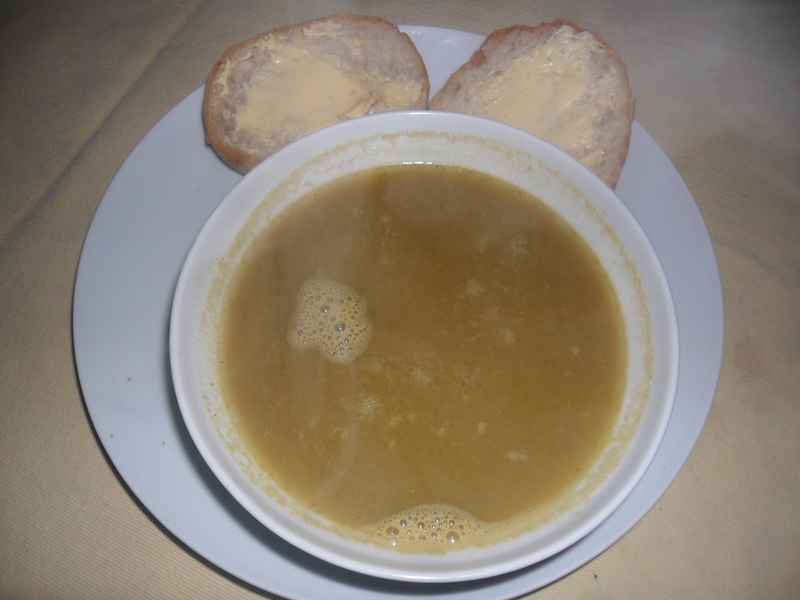 I made some ‘Pea Pod’ soup for my eldest daughter as she loves this and I found a bag of pea pods lurking at the bottom of my freezer. You can read how to make the soup here. 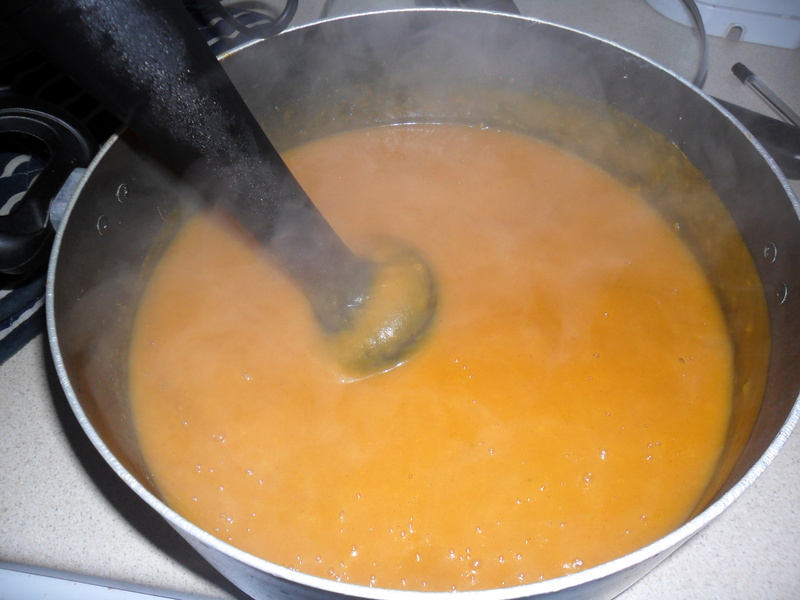 This soup is an old wartime recipe that is extremely cheap to make, though it is a bit like ‘marmite’….you love it or hate it! 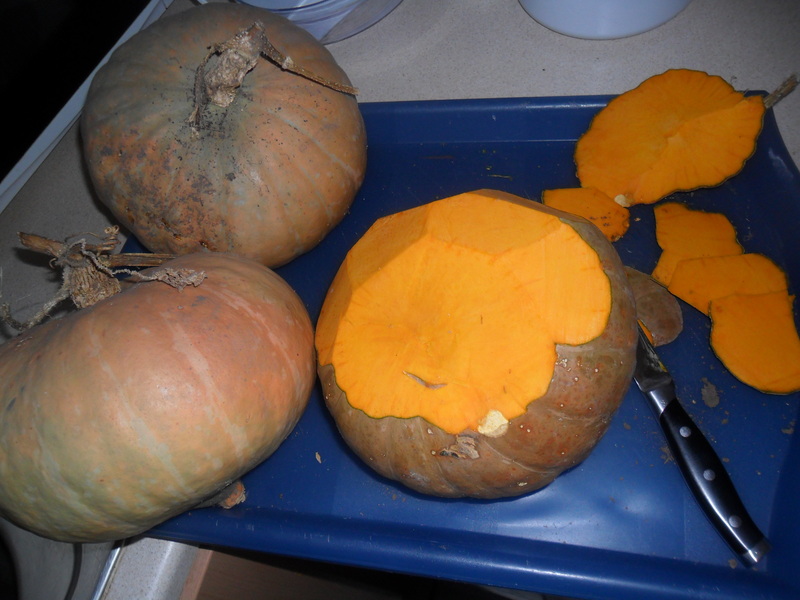 I finally got round to making some soup with my ‘Jamaican Pumpkins’. 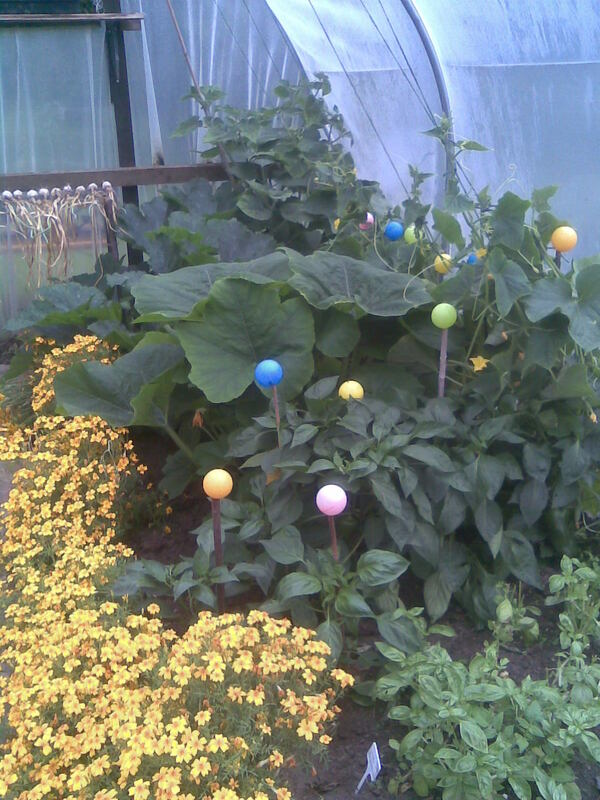 These pumpkins are smaller than the halloween pumpkins I grow, but they are usually bigger than the ones in the photo below (I think this was due to the wet weather over the summer). These pumpkins are also great for roasting as they hold their shape better during cooking. 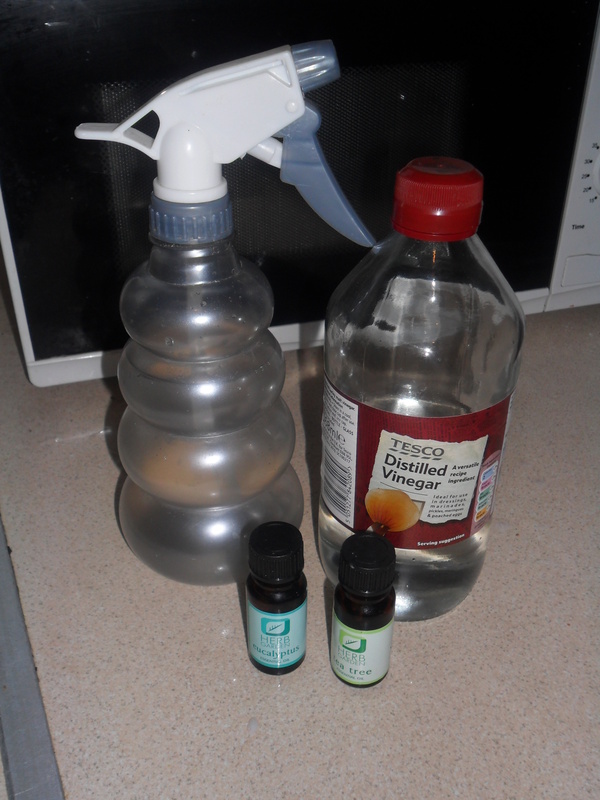 I also topped up my ‘vinegar spray’ which I use in my kitchen as a mulitipurpose anti-bacterial cleaner. 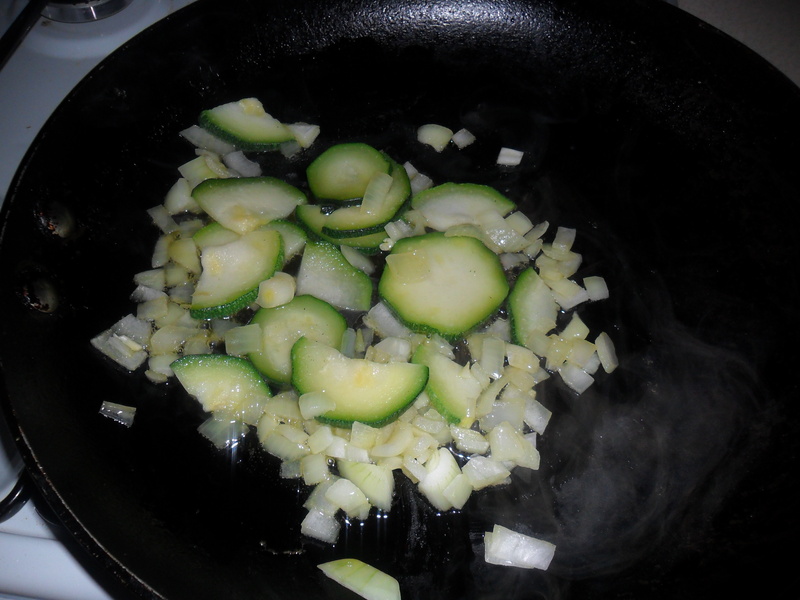 I use white vinegar (which cuts through grease and grime) and a few drops of teatree oil (which is antibacterial). 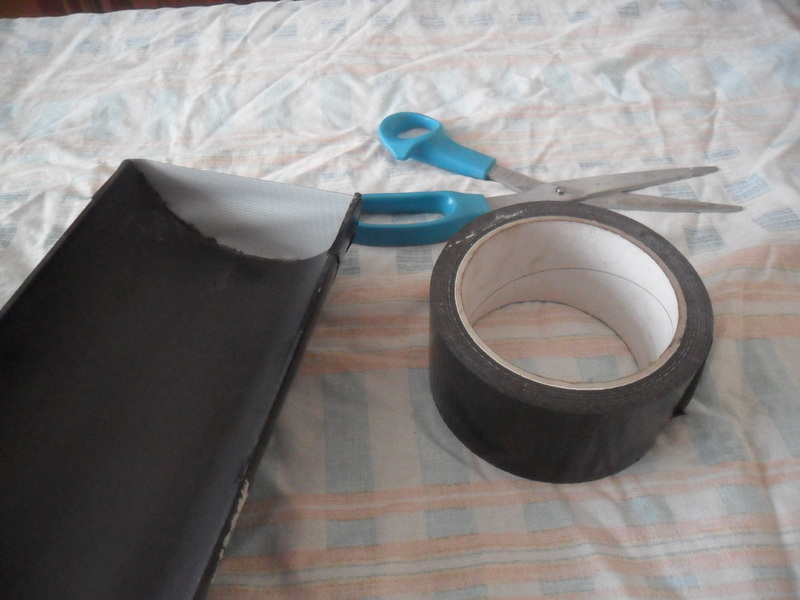 You can read all about the old fashion cleaning methods that I use here. 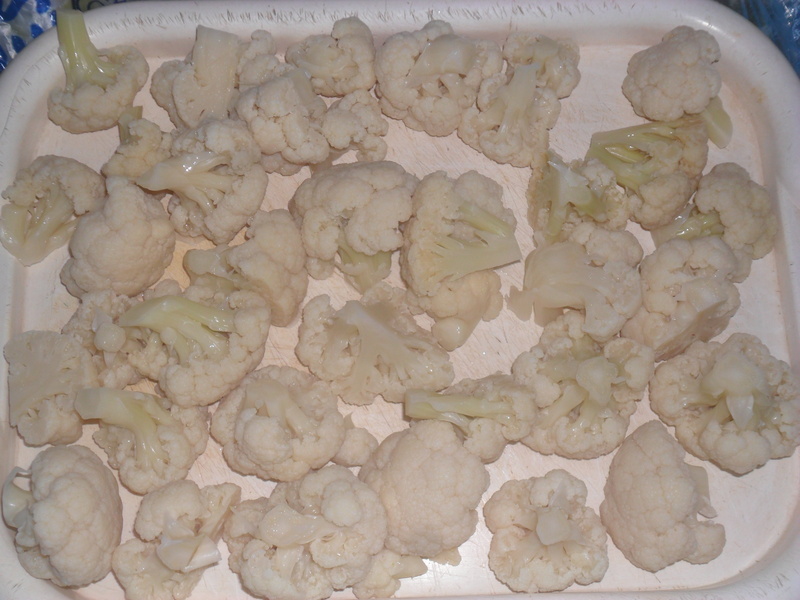 I then blanched and froze my allotment cauliflowers, that I picked this week. I am very proud of them. 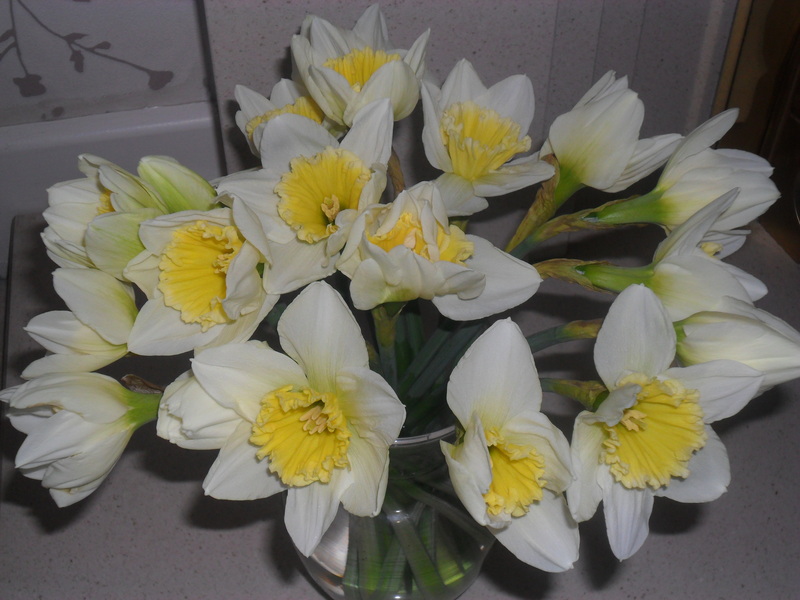 I cut them into florets and blanched them for 2 minutes. 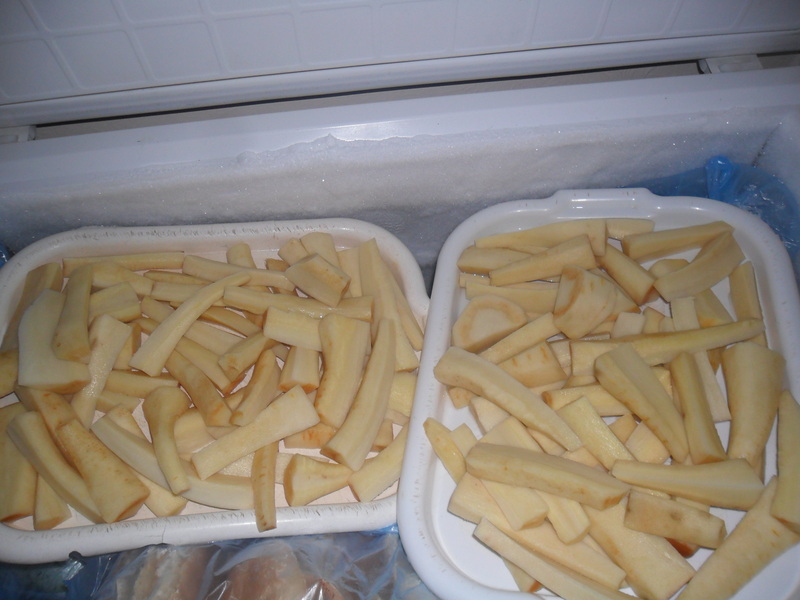 You can reading about freezing vegetables here. 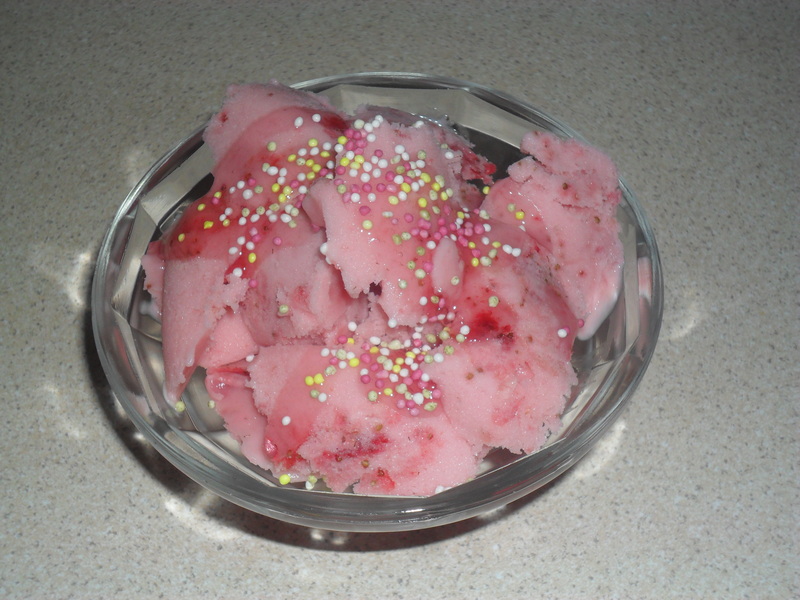 Finally, I thought I would experiment and make a ‘Healthier Ice cream’. Technically, I can’t call this an ‘ice cream’ as it’s under 4% fat, but it tastes really nice. (refer to your ice cream maker for timings and how much to fill the bowl). 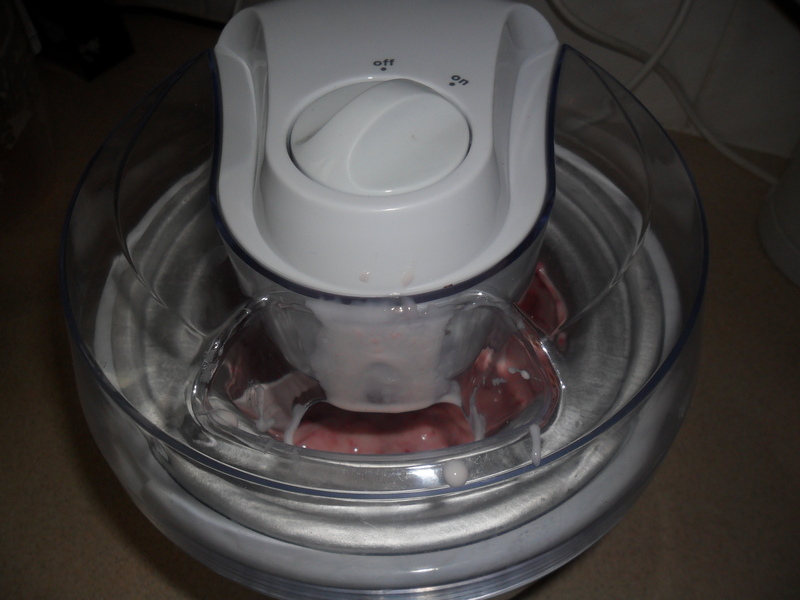 If you haven’t got an ice cream maker, just put the blended ingrediants into a container and freeze. 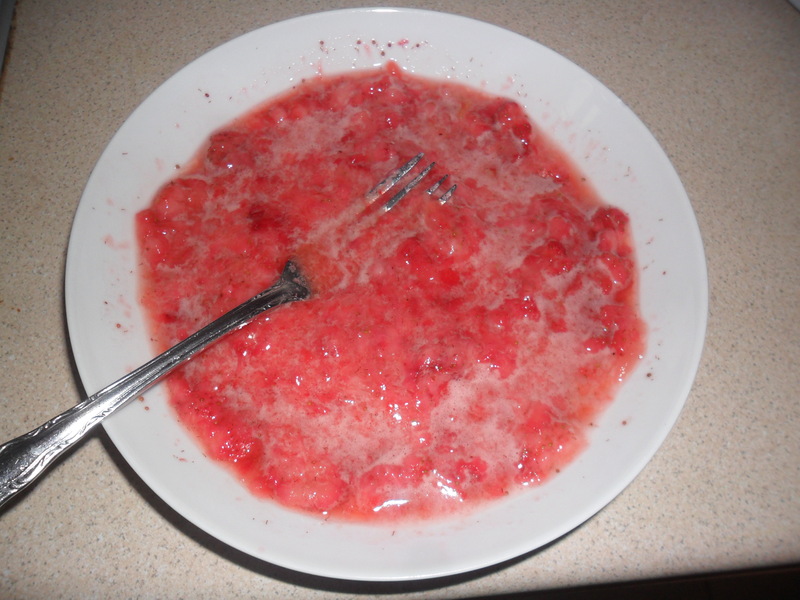 Remove from the freezer every 1-2 hours and mash vigourously with a fork to break up the ice crystals. As it’s Easter I’ll be taking a break to spend time with my family, so I will be back on Friday 5th April. ‘N-P-K’ …What does this mean? Fertilisers Explained. This is something that mystified me, until it was explained to me at college a few years ago, when I took my RHS Horticulture Course. When it’s explained properly, it’s not really that hard to understand at all, though some books make you feel like you need a scientific degree just to open the page, let alone read it. 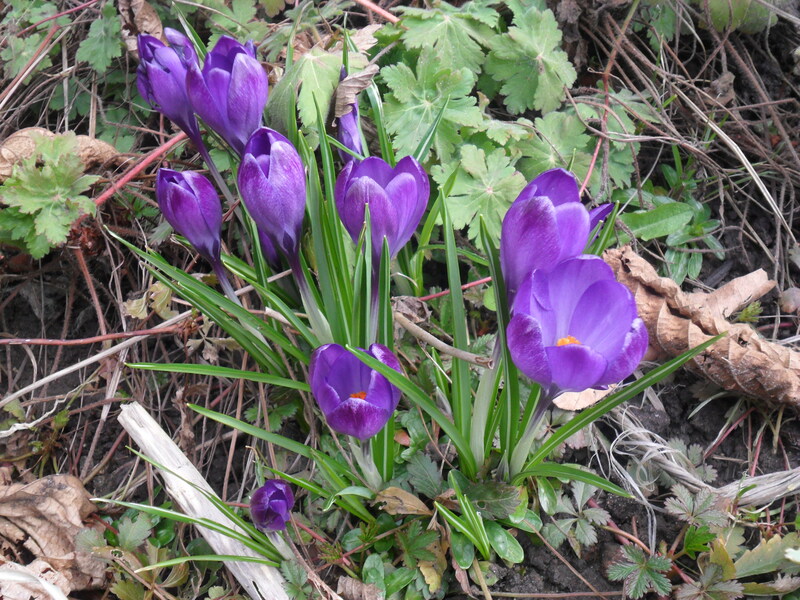 As spring is around the corner, I thought it would be nice to take a look at ‘N-P-K’, in the hope that my explanation will help to unravel the mystery surrounding it. I’ll apologise now for those who know this already, but it’s great to refresh your knowledge sometimes. 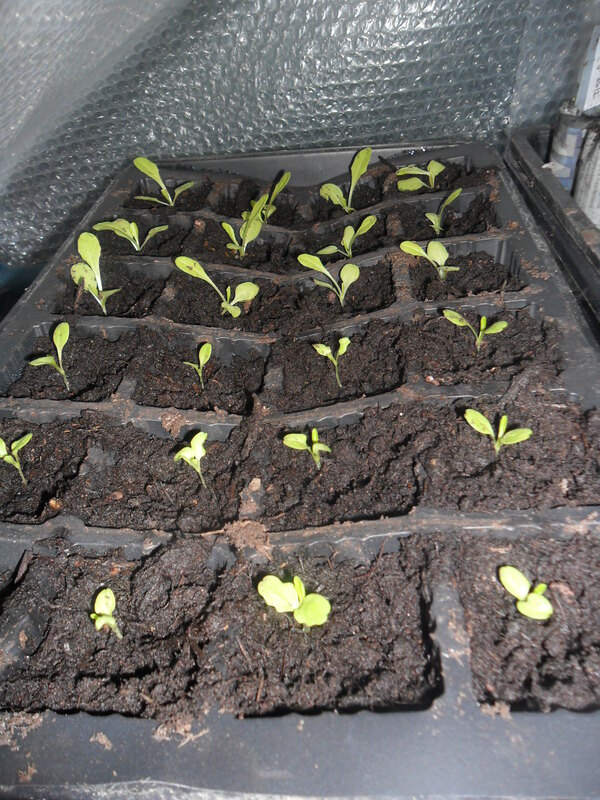 A German scientist called Justus Von Liebig (1803-1873), came up with a theory that Nitrogen, Phosphorous and Potassium are mainly responsible for healthy plant growth. 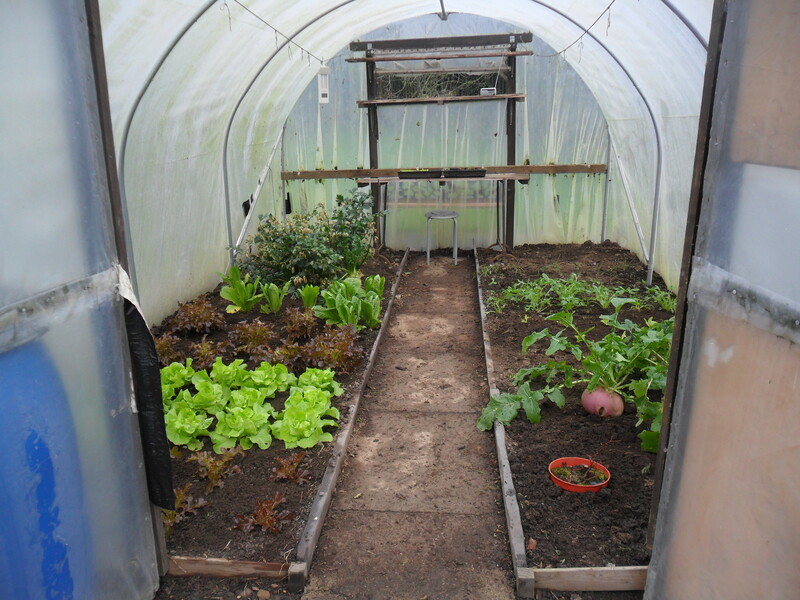 Of course it isn’t quite this simple, as there are lots of things that promote healthy plant growth, such as soil structure, soil pH, and trace elements (I’ll cover them another time). 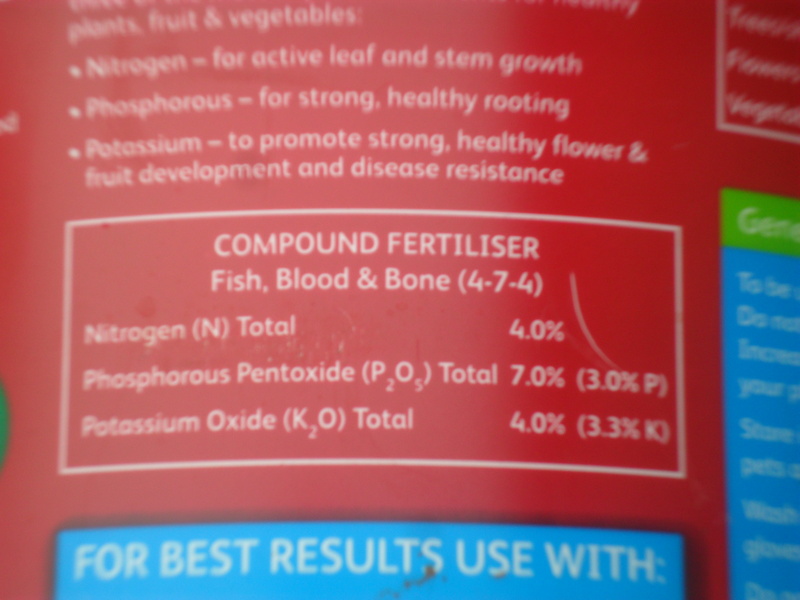 But mainly, when choosing a fertiliser, it’s the Nitrogen, Phosphorous and Potassium (N-P-K) that we look for. 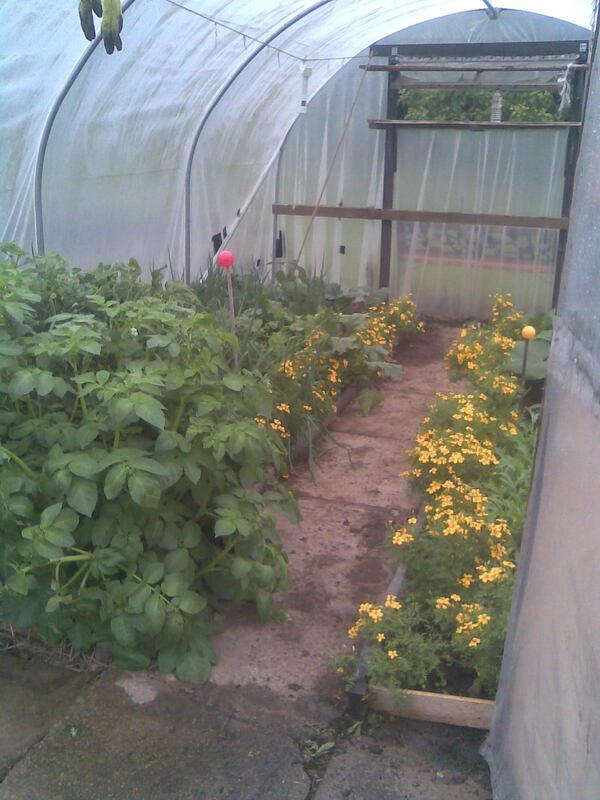 Fertilisers are used to improve plant growth. 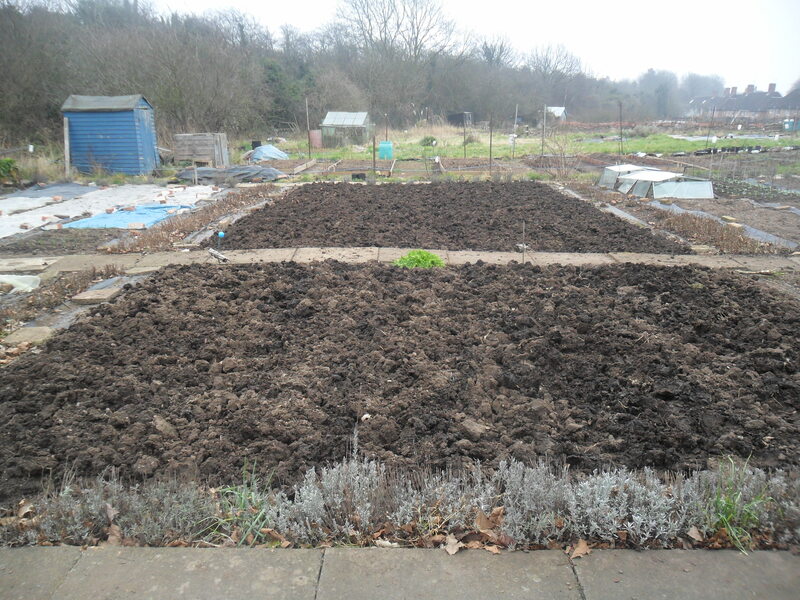 If your soil is healthy, you don’t necessarily need a fertiliser, but by using them you may produce a higher yield of fruit and vegetables or a better show of flowers. Though it must be noted, you can over feed plants too, which can also cause problems, so always follow the product instructions. 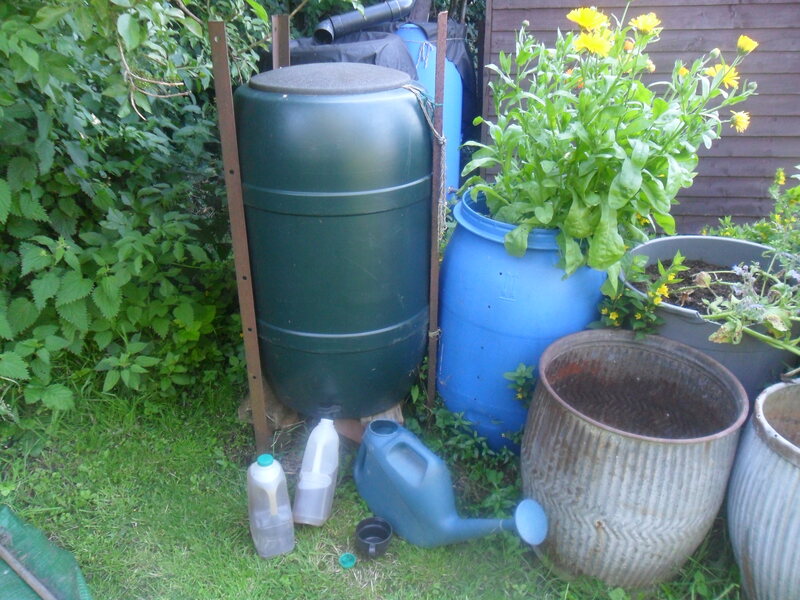 If you look on your box or tub of fertiliser, it will have three numbers. The numbers reflect the percentage of the nutrient, per pound of plant food. The first number represents Nitrogen (N), the second number represents Phosphorus (P) and the third number represents Potassium (K). 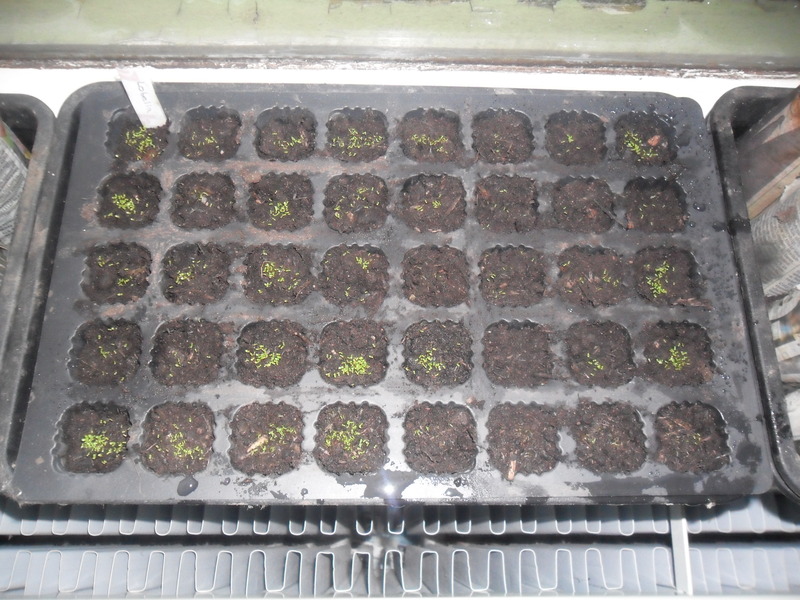 So you can see from the picture above, the feed is slightly higher in Phosphorus (P). (Please stay with me and try not to switch off, as these figures really do mean something to your fruit, vegetables and flowers). 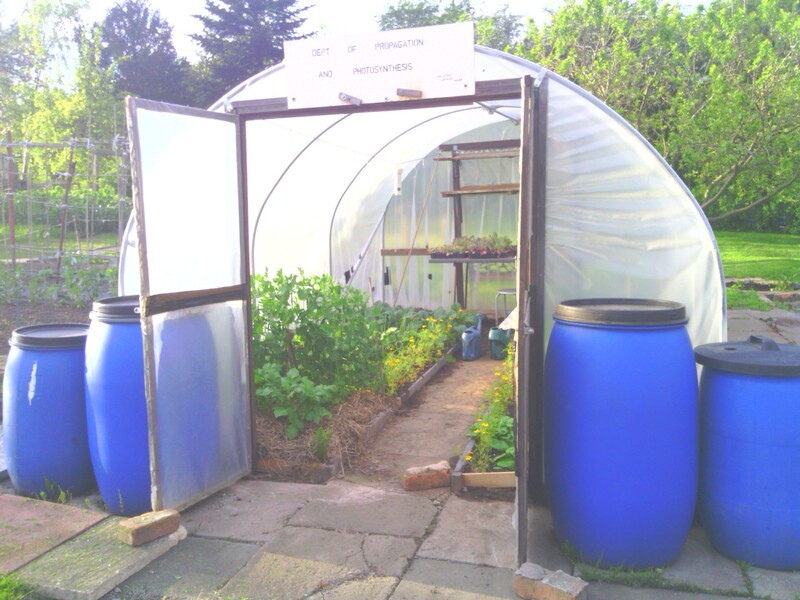 Nitrogen promotes a good, green leafy growth. 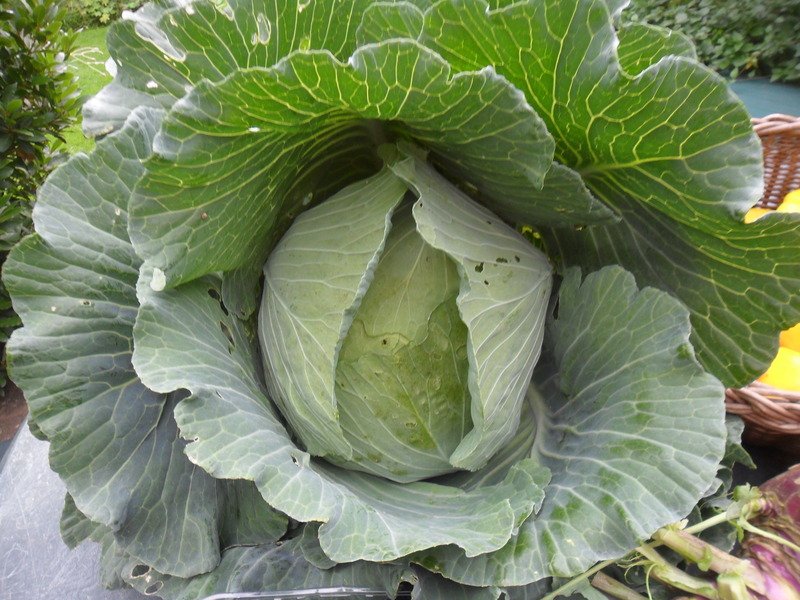 This is particularly important for green leafy vegetables like cabbages, spinach etc. If you have a nitrogen deficiency, you will most likely see spindly yellow plants and leaves, occasionally with a pink tint. 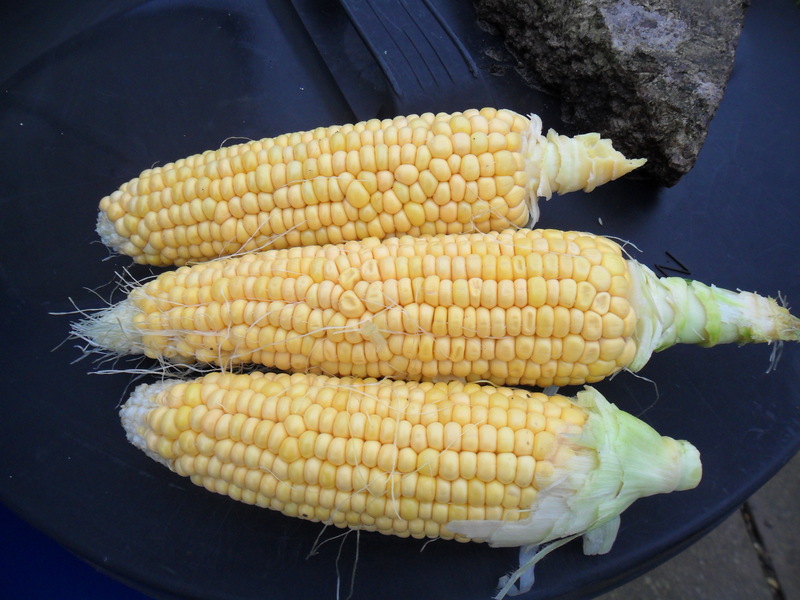 A nitrogen deficiency will cause stunted growth. High nitrogen feeds include sulphate of ammonia and poultry manure. 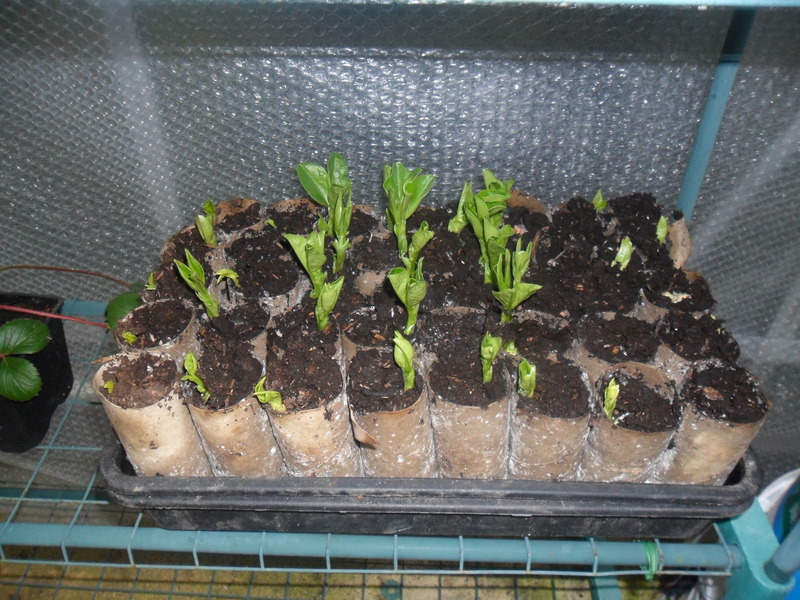 Phosphorus promotes strong healthy root growth and shoot growth. It is rare to have a phosphorus shortage in the soil, but it can happen if you have a heavy clay soil or suffer with a very high rainfall. 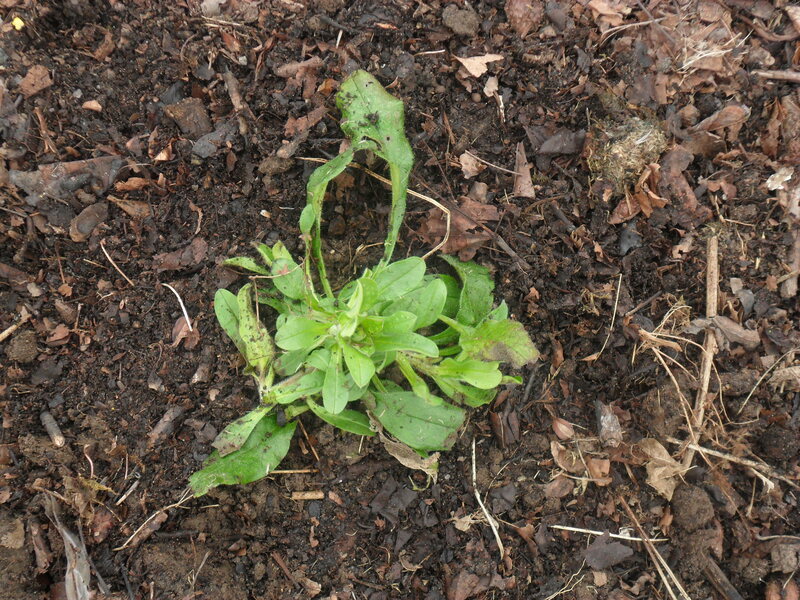 If your plants have a phosphorus deficiency, they will be slow to grow and have a dull, yellow foliage. High phosphorus feeds include superphosphate or bonemeal. Potassium helps promote better fruit and flowers and the overall hardiness of the plant. 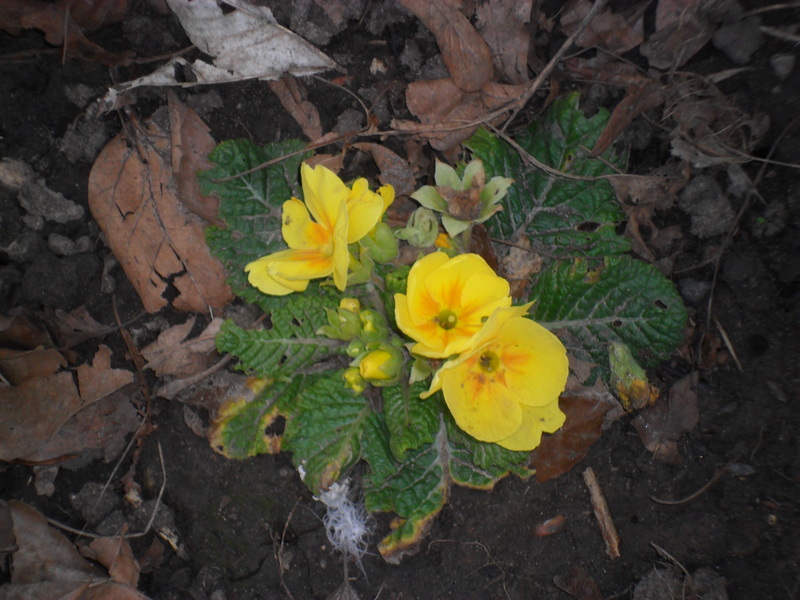 If your plants have a potassium deficiency, the leaves will become yellow, with brown around the edges and you will have poor fruit and flowers. 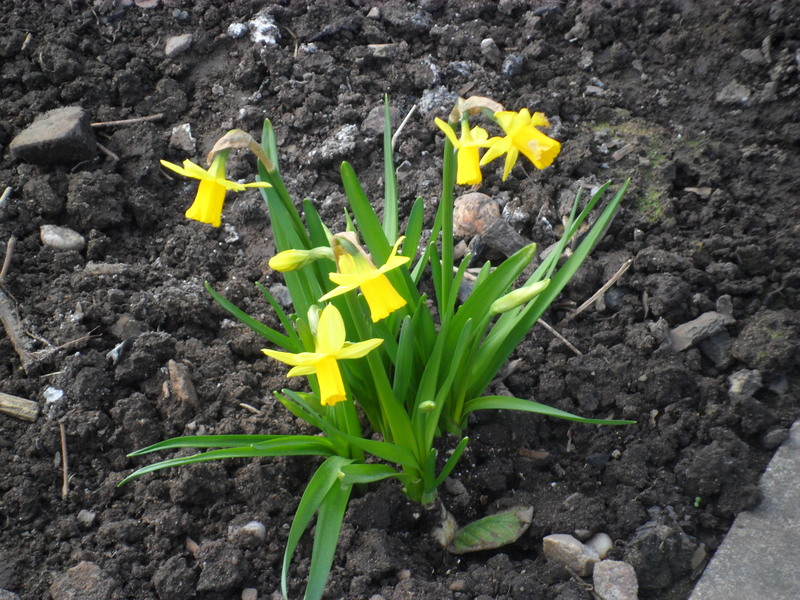 Shortages of potassium are more likely to be found on light sandy soils, as a clay soil will hold potassium well. A high potassium feed is sulphate of potash. 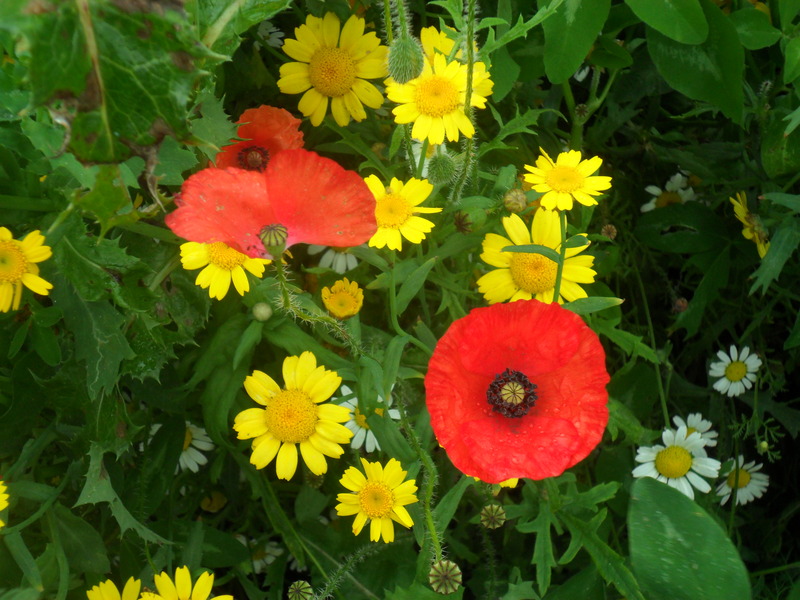 So what is the difference between a ‘Compound Fertiliser’ and a ‘Straight Fertiliser’? e.g. 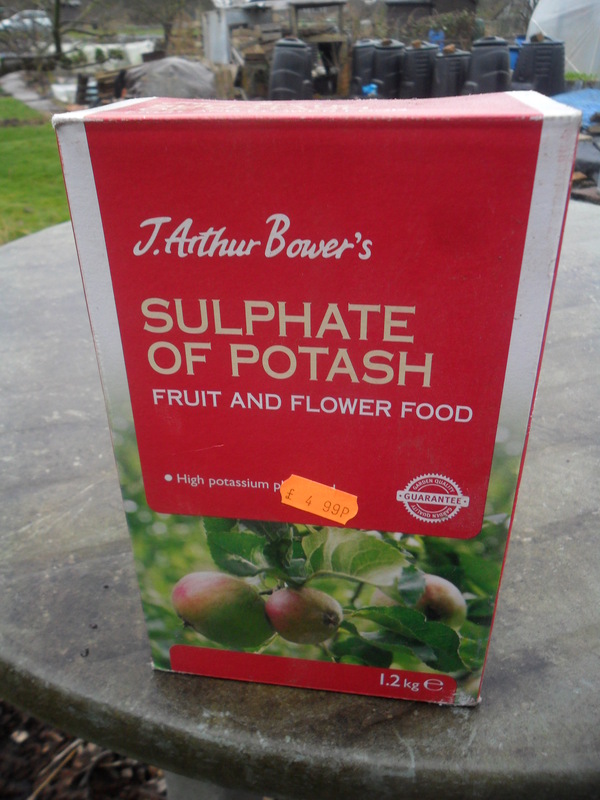 sulphate of potash (which is used around fruit bushes in February / March). e.g. 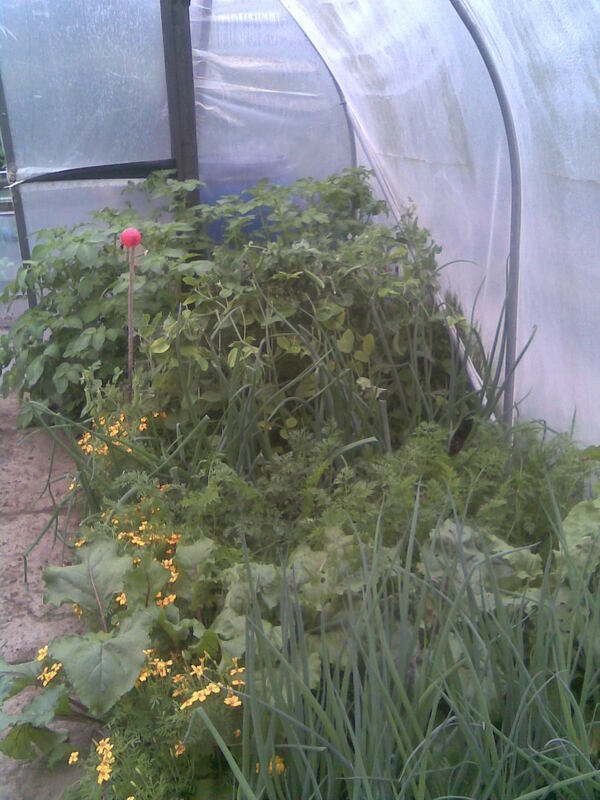 Blood, fish and bone (organic) or Grow more (in-organic). How do you apply fertilisers? 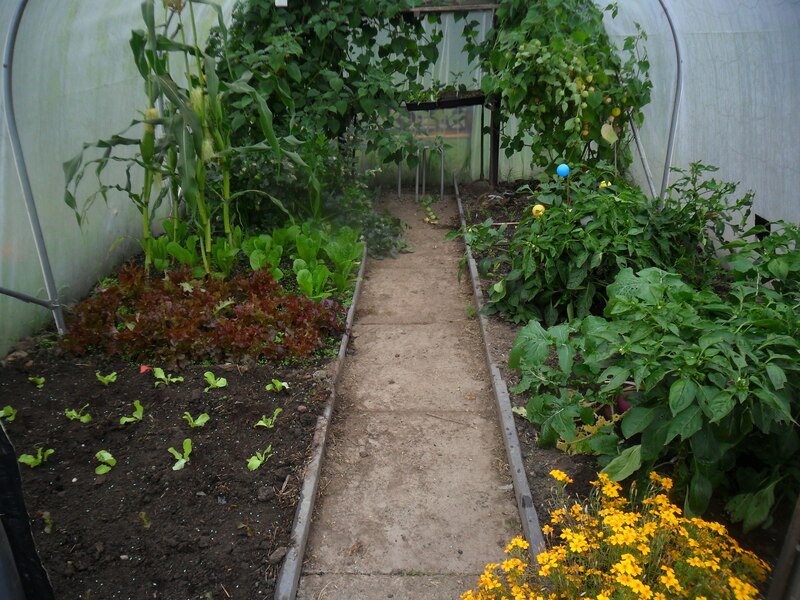 Top dressing: Sprinkle the fertiliser around the plant and hoe or lightly fork into the ground. 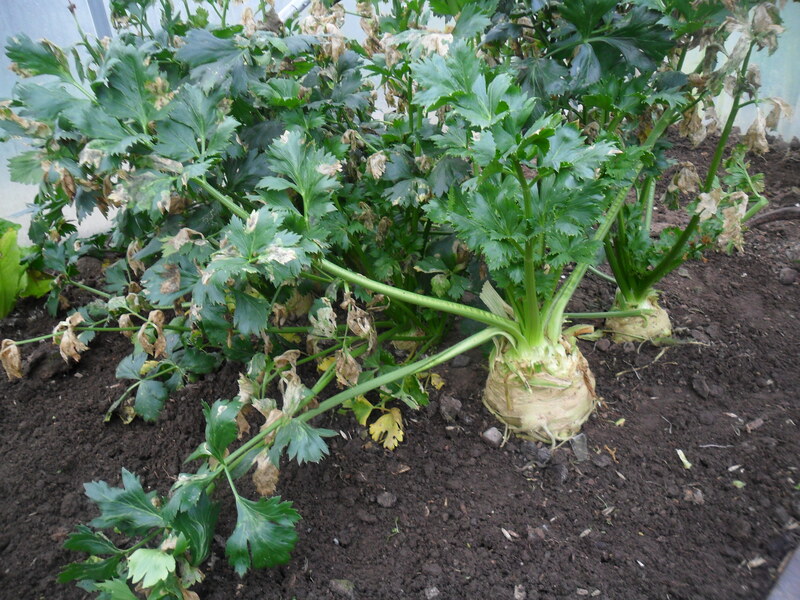 Be careful not to get any fertiliser onto the leaves of the plant, as this can cause scorching. 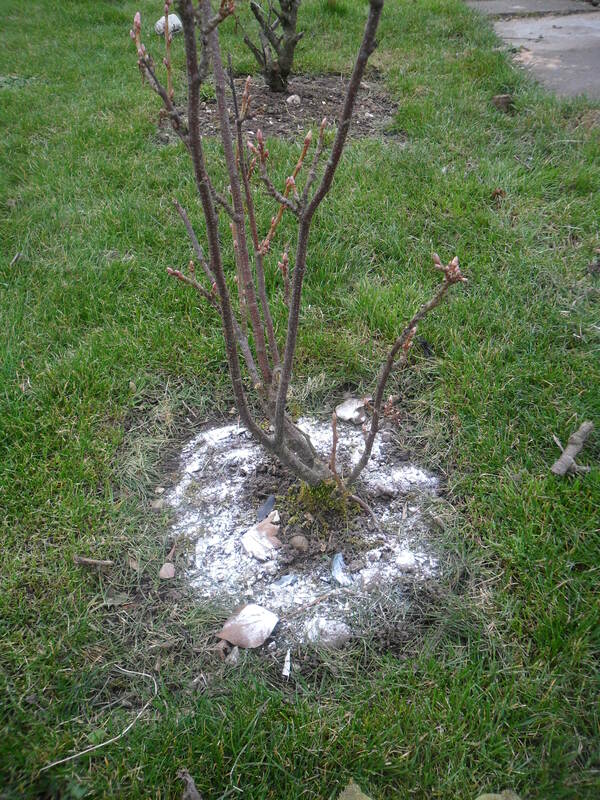 Base dressing: This is where you rake the fertiliser into the soil before you plant into it. 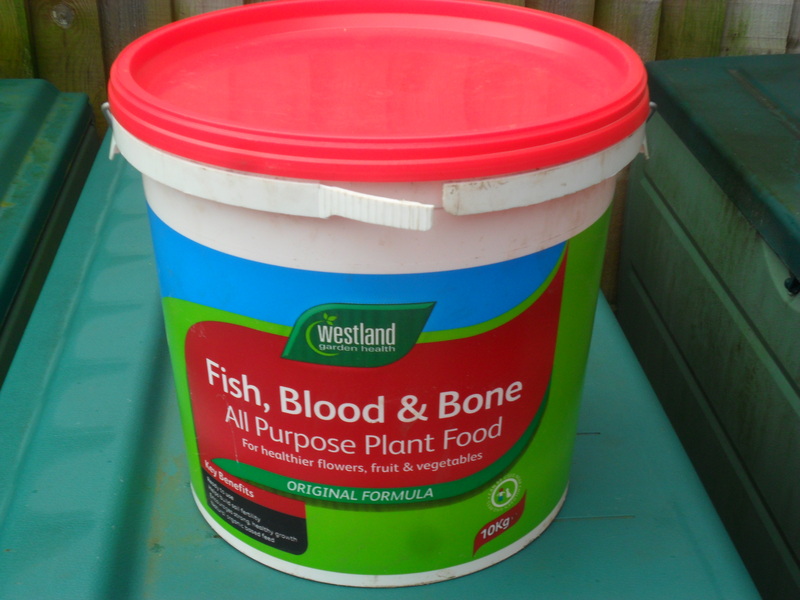 I usually spread Blood, fish and bone two weeks before I plant into the soil. 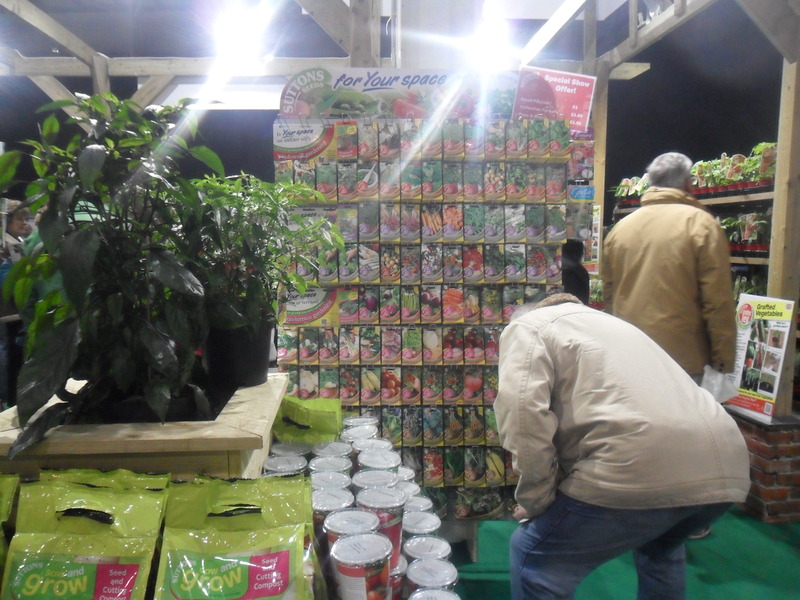 Liquid fertilisers / soluble powders: These can be watered straight onto the plant roots. 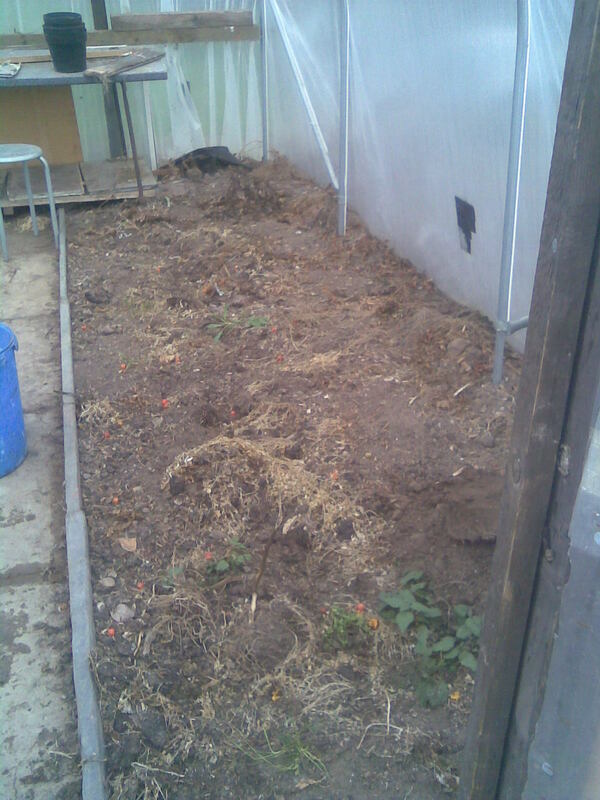 A good example of this is a tomato feed, which is watered onto the plant roots each week or fortnightly. 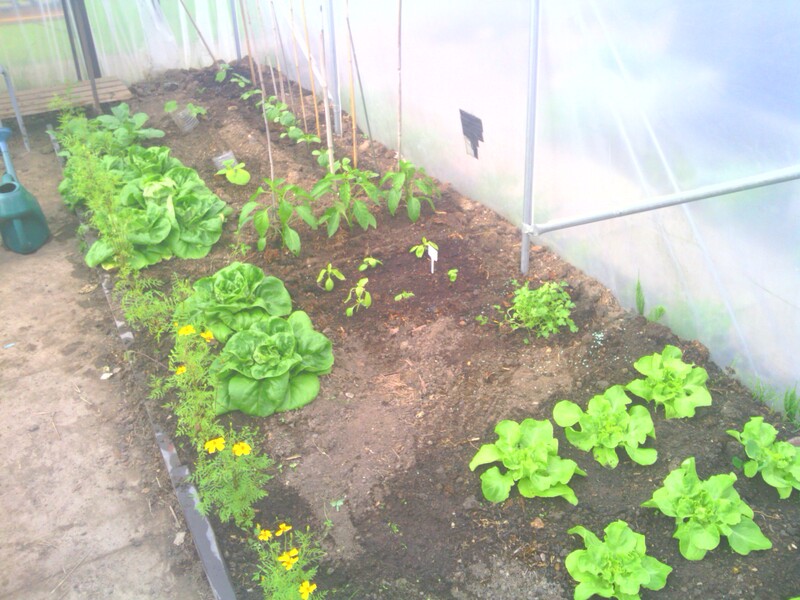 The nutrients are available to the plant straight away. Again, if you water directly onto the leaves, it can cause scorching. To finish off with, I just wanted to remind you that fertilisers should not be used as an alternative to soil conditioners. 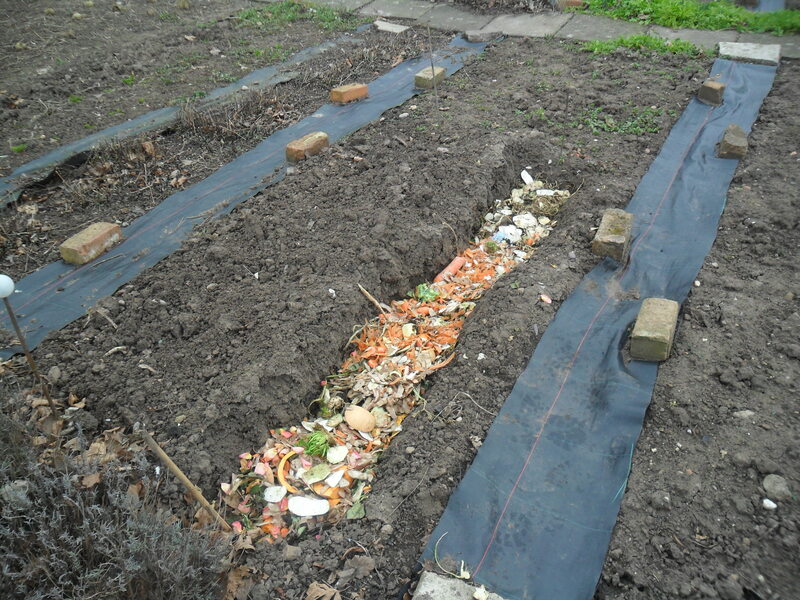 Leaf mould, compost and manure all help to break up the soil and improve the soil structure. 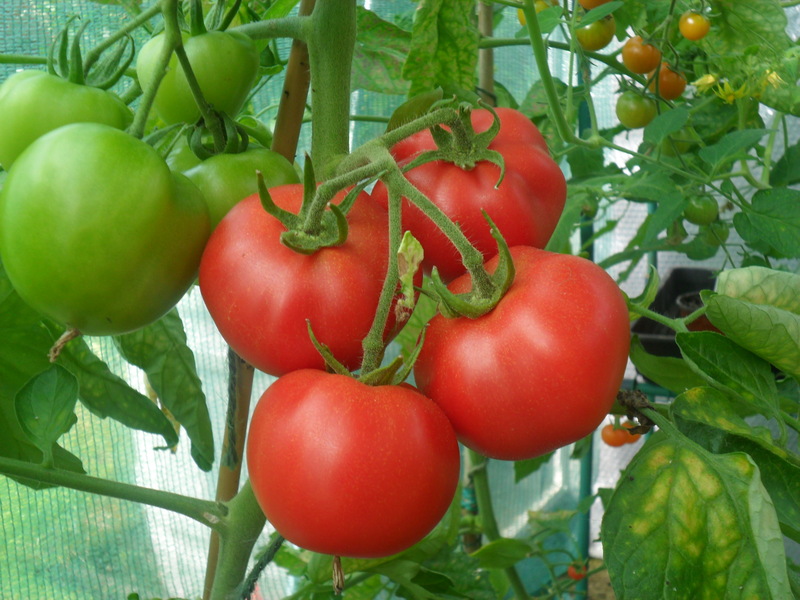 This in turn, will help the plant to take up the nutrients, which makes them stronger and able to provide us with our wonderful, fruit, vegetables and flowers. It smelt very fresh! 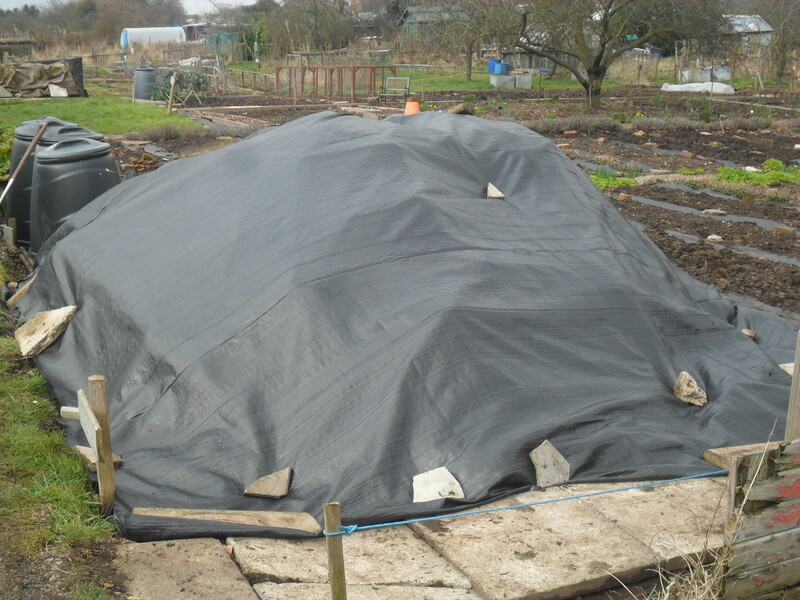 I covered it, to stop the nutrients leaching out when it rains. 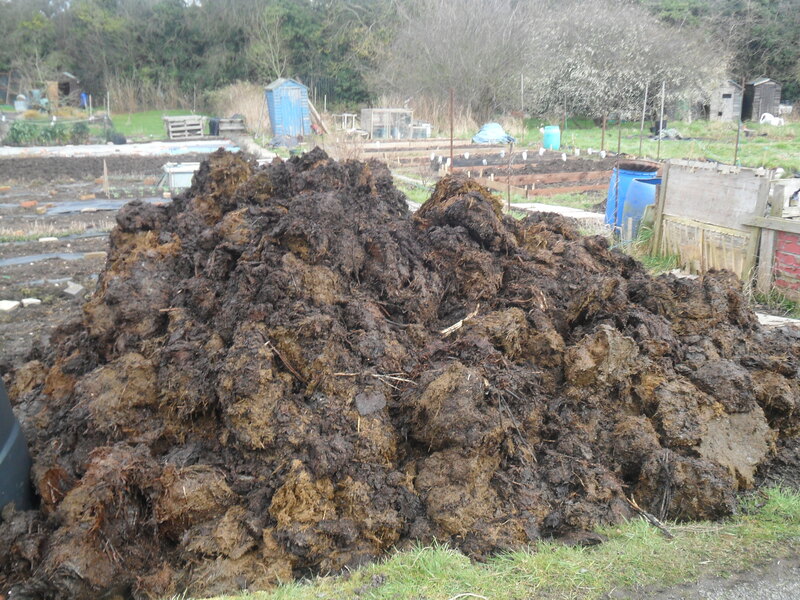 I won’t be using this manure until September, so this will give it a good six months to continue rotting down. 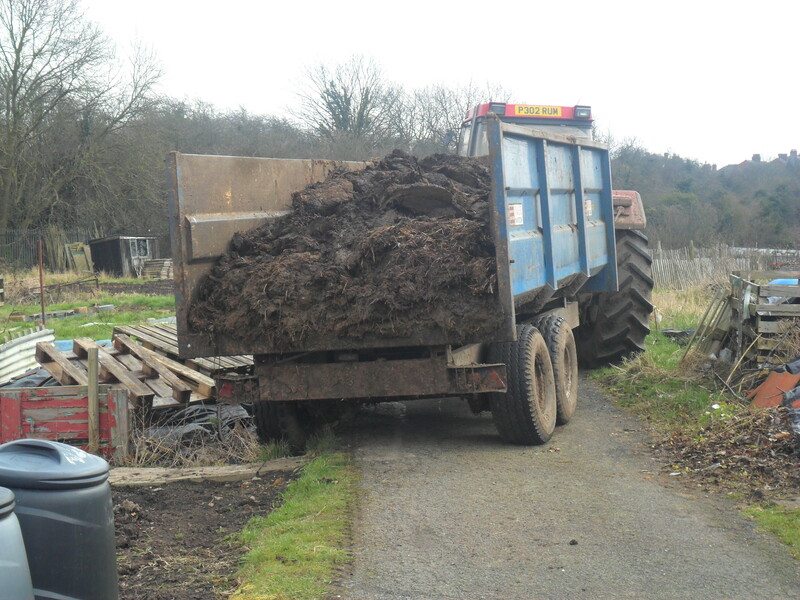 My husband had the day off work to help me with the delivery, ready to clear any manure that dropped onto the road. The delivery man was great though and managed to drop the whole load exactly where I wanted him too, which made it very easy for us. Am I the only woman that gets excited over a ton of manure? 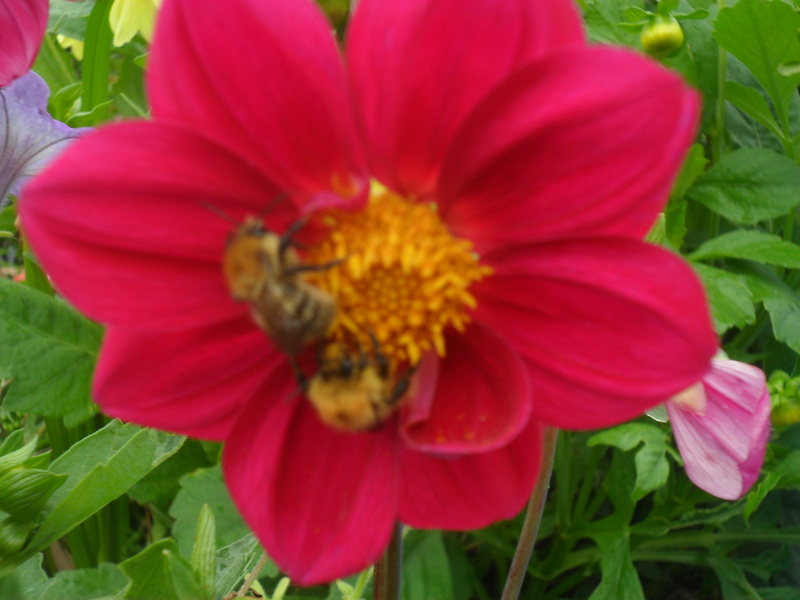 On Saturday I went to the Edible Garden Show with my two sisters. My eldest sister paid for our tickets as a christmas present and I loved it. 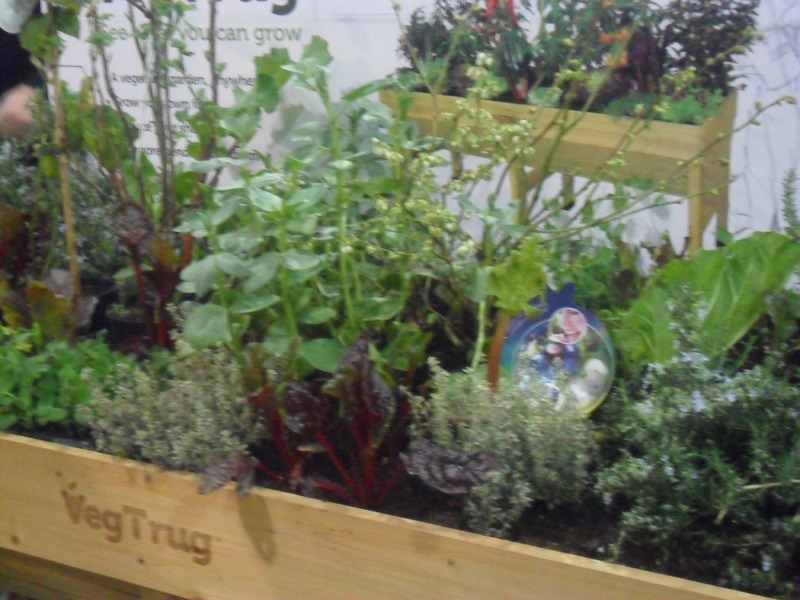 You can read the ‘Edible Garden Show’ Website here. There were plenty of interesting stalls, selling products and giving advice. It was great to wander around. There were also lots of interesting talks which I enjoyed. 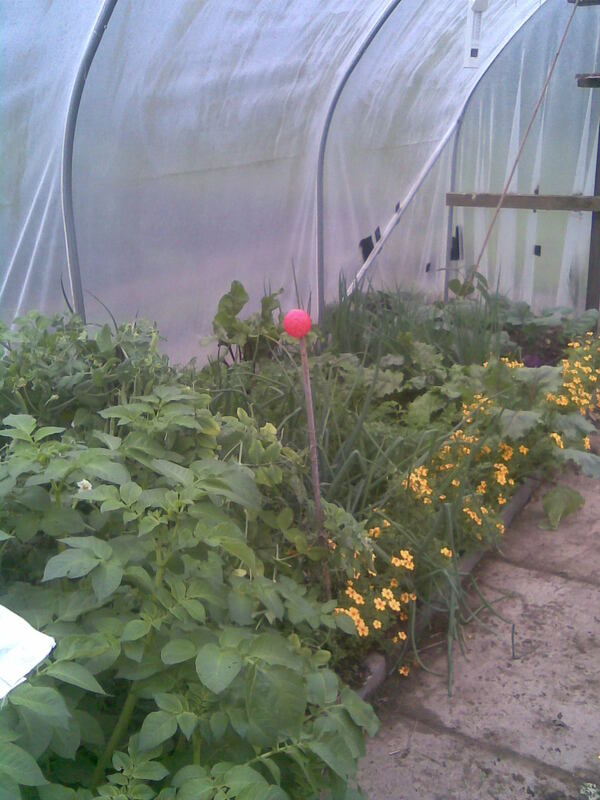 Alys Fowler talked about growing about fruit in small places, showing photos of her own garden. 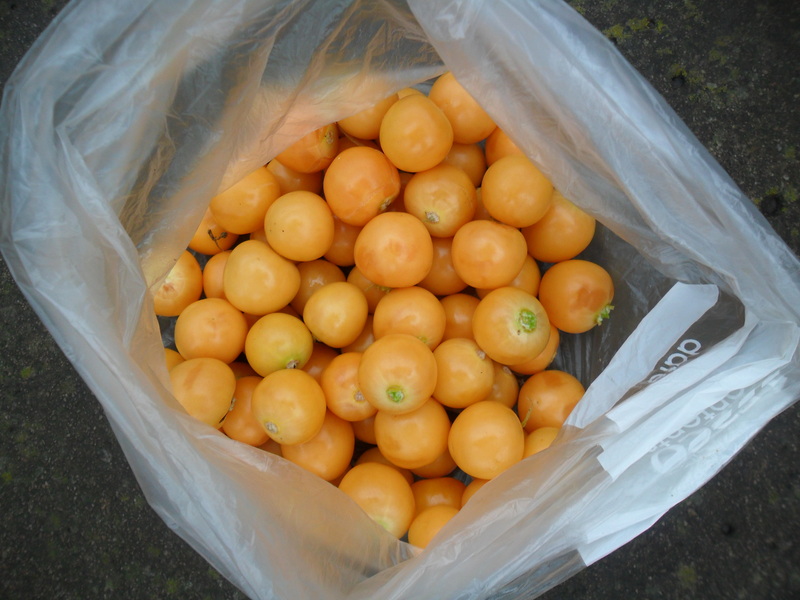 She also included some photos of fruits that she foraged from car parks local to her, which was great. 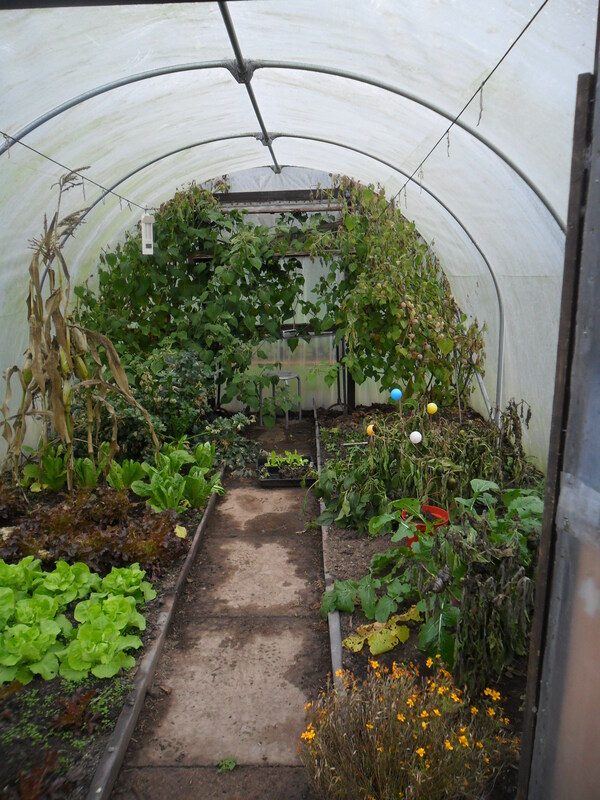 Another really good talk, was given by Bob Flowerdew, a wonderful organic gardener. He talked about ‘No Work Growing’, which was basically ways to reduce or eliminate unnecessary chores. He was very funny at times. Earlier in the day I was really very lucky. 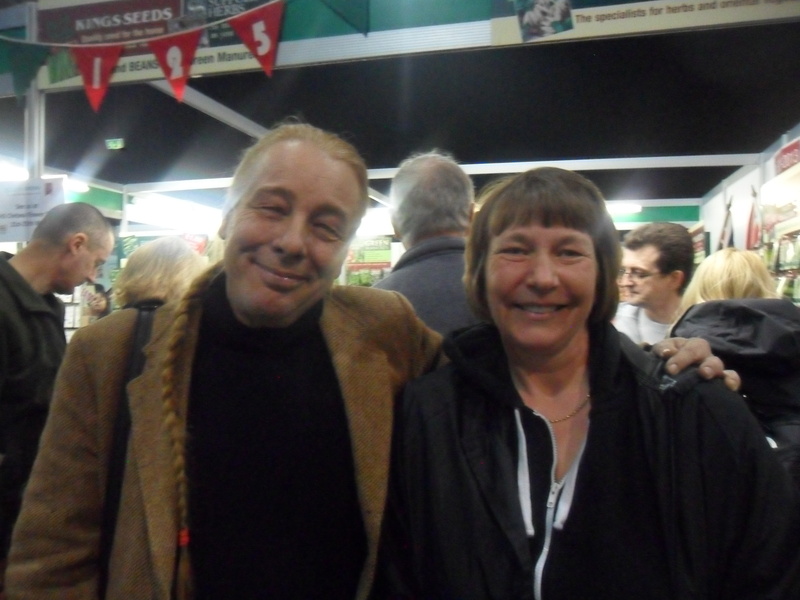 I noticed Bob Flowerdew in a quiet part of the hall and I asked him if I could have a photograph with him. He was lovely and put his arm round me while the lady with him took a photo for me. It made my day. 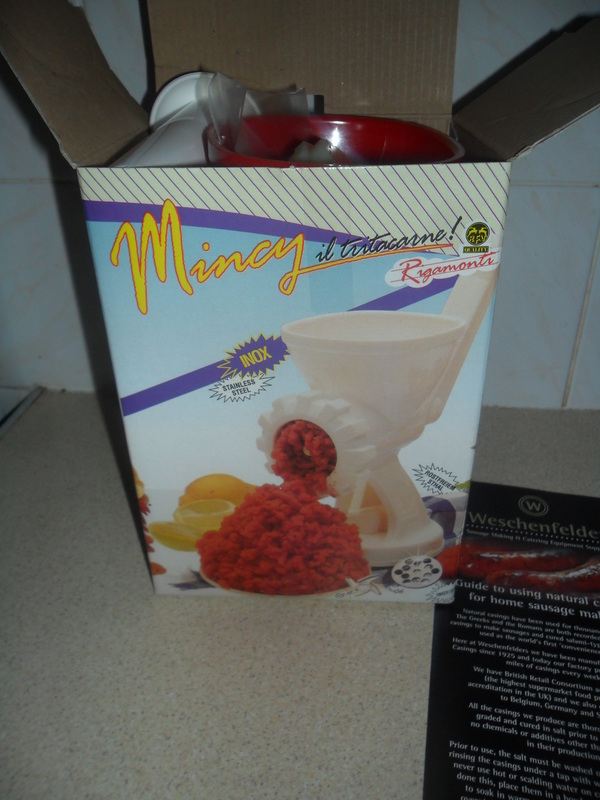 A ‘Meat Mincer ‘ with a sausage making attachment. 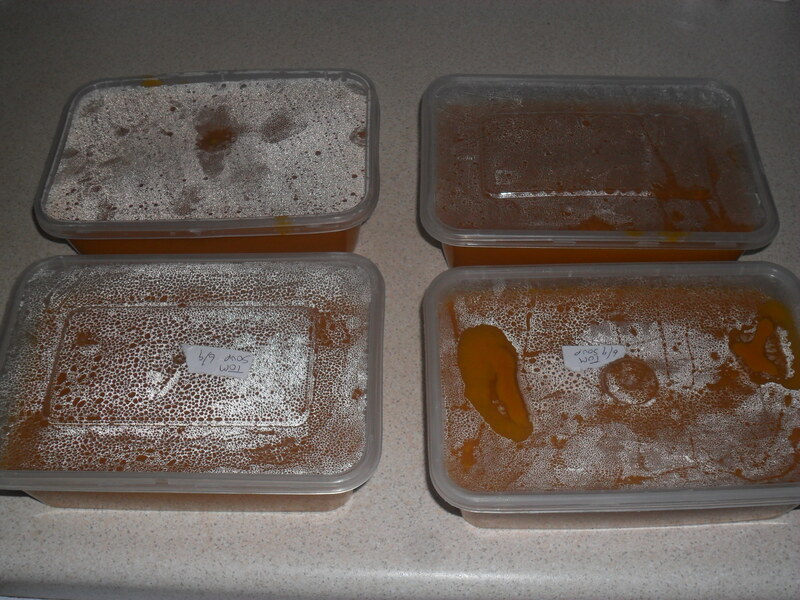 A cumberland sausage mix and some sausage skins also came with it. It cost me £20, but I was assured it works perfectly. I have noticed since, that it can also be used to make pasta too. I am really looking forward to using it and I have told him I will rewiew it on my blog, so he can see how I get on. 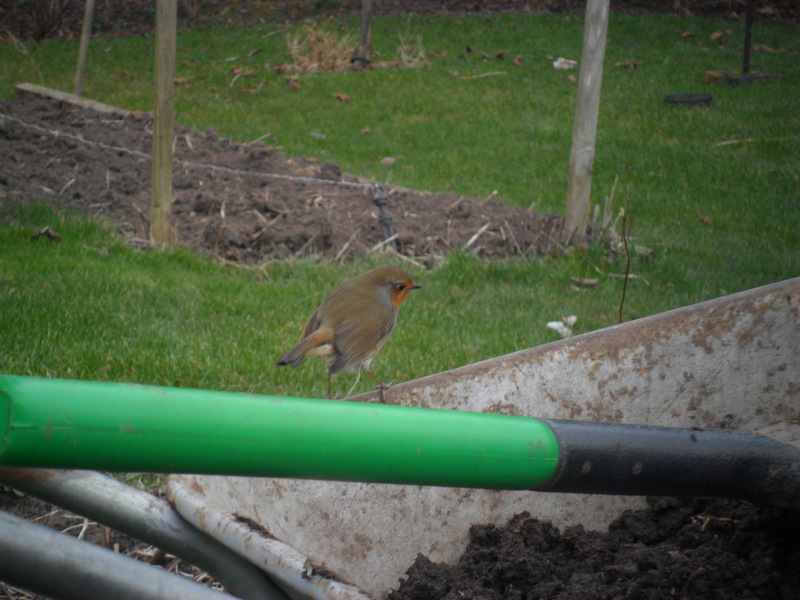 This is the robin that always comes over to me when I’m digging or moving compost at my allotment. I always reward him with some tasty mealworms on my bird feeder. 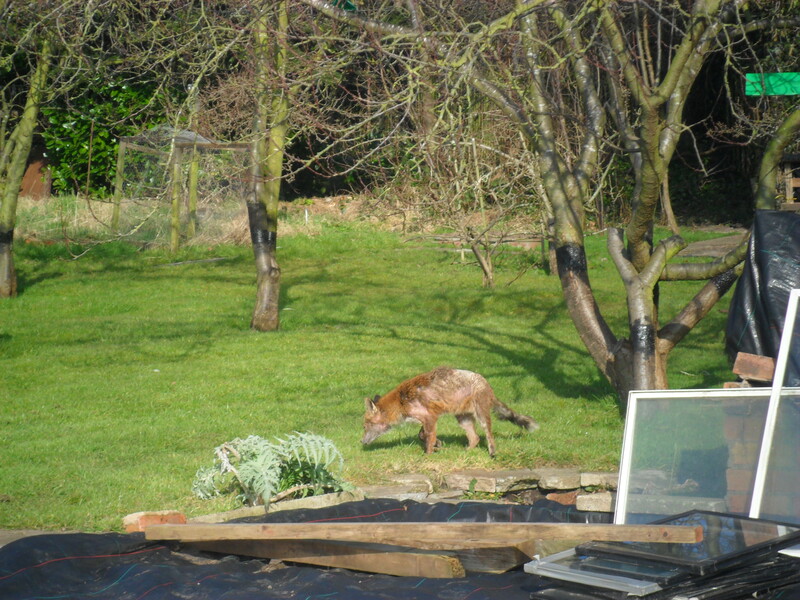 This is ‘Scraggy Fox’ that is always hanging around my plot. He had just been drinking out of one of my ponds, he must have been thirsty. Poor ‘Scraggy Fox’ has a skin condition which has caused some of his fur to fall out and I feel very sorry for him. I don’t feed him as I don’t like to encourage town foxes, but he has been visiting now for two years and has become a familiar sight to me. 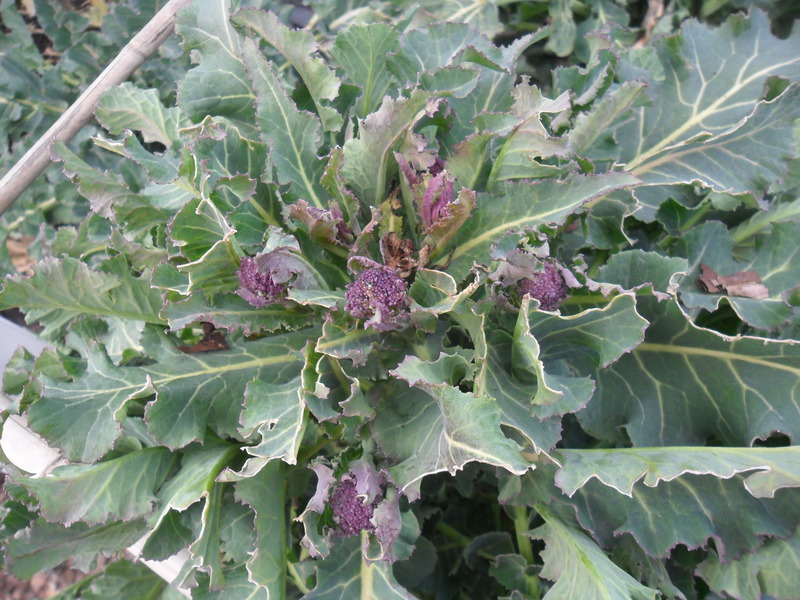 The photo above is something that has surprised me… My cauliflowers were grown to be harvested last August, but because the weather was so dreadful last year, they are only just ready now. Luckily they were an ‘all year round’ cauliflower. 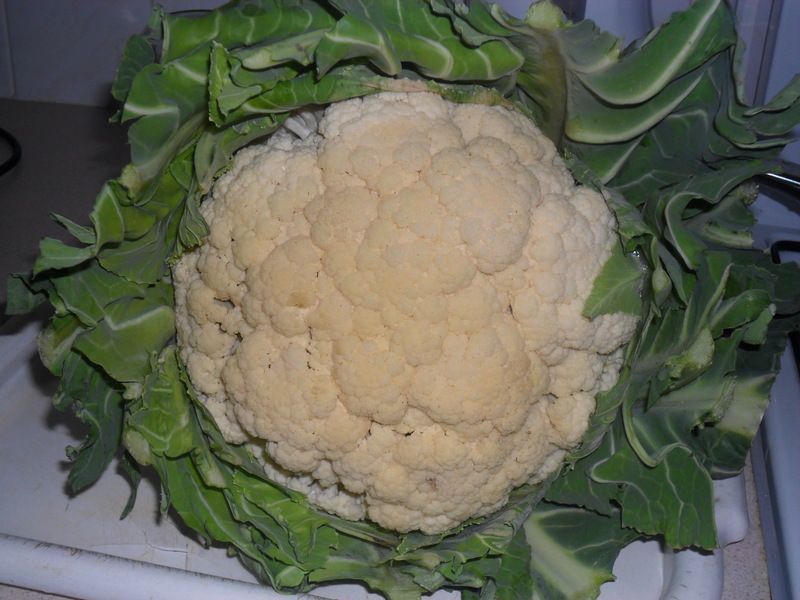 This cauliflower fed us all for two meals and I have another five cauliflowers still to pick, which is marvelous. 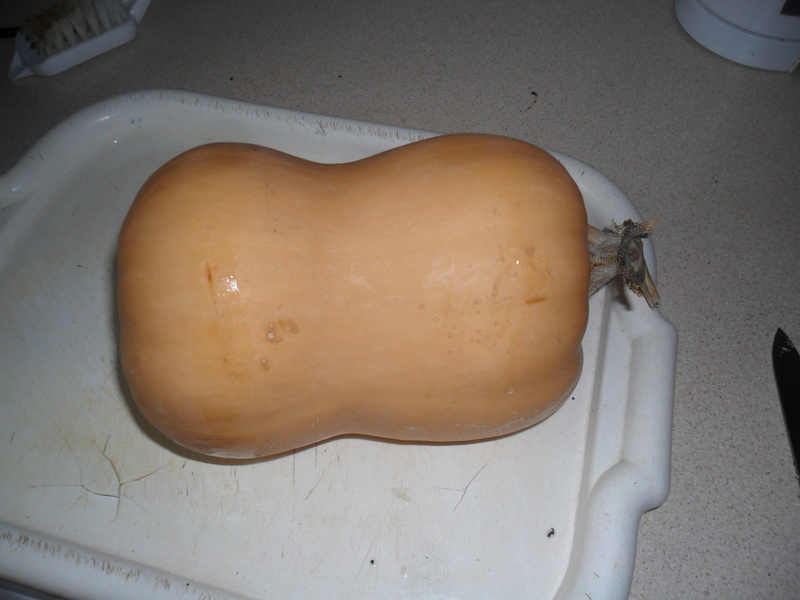 Finally, sadly we had our last homegrown butternut squash this week. 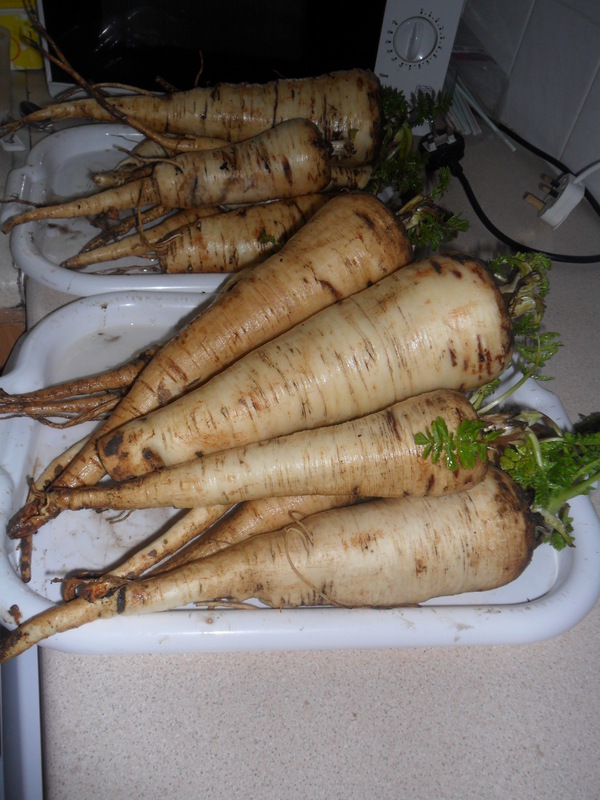 It was lovely roasted and was enough for a couple of meals. 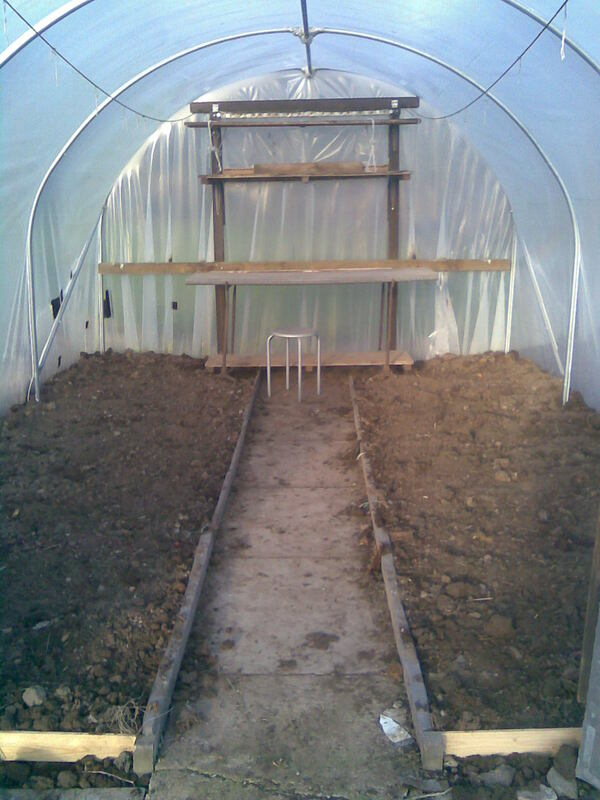 This demonstrates how long they will store if they have the right conditions. I store them in our bedroom, as it’s the coldest room of the house …so very romantic lol. The weather has been strange this week. We woke up to a layer of snow on Monday morning and have had snow showers on and off all week. It has been so cold. 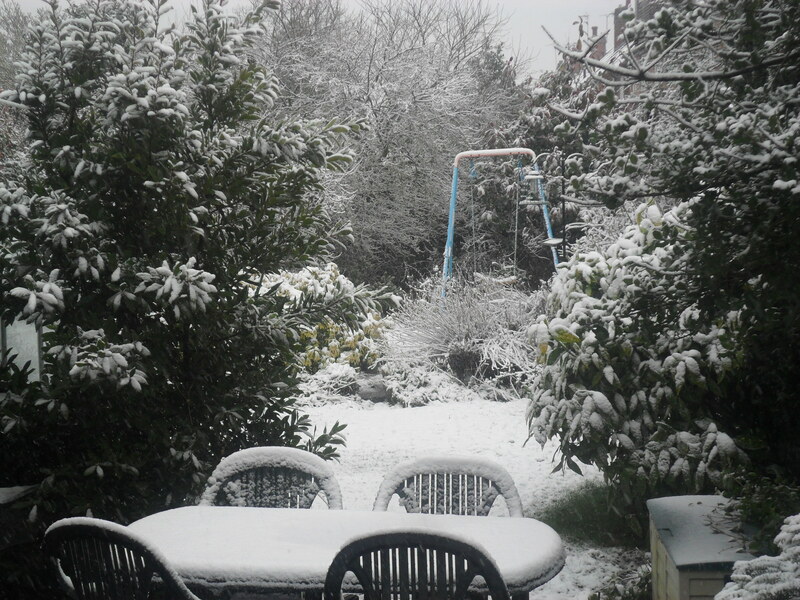 On Tuesday it was -2C outside, which is way below average temperatures for March and the weatherman reported that this time last year, the temperature recorded was 18C! 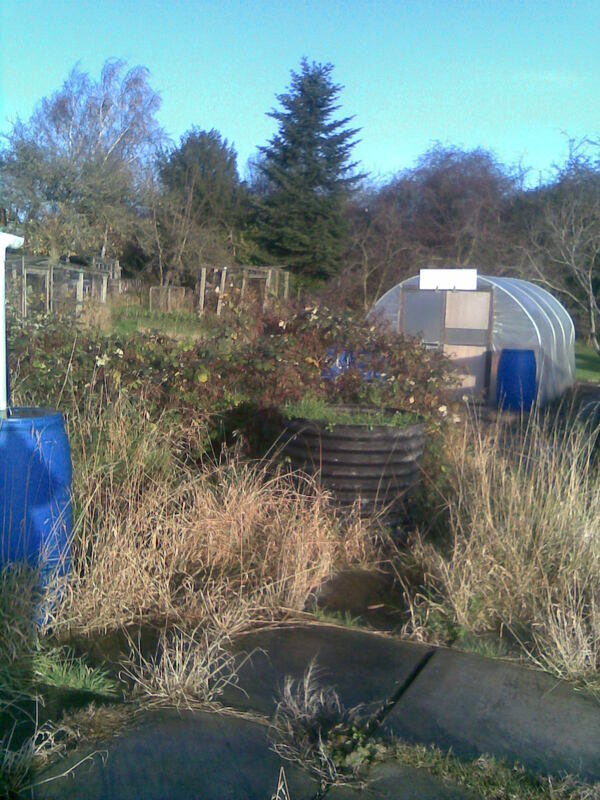 Never the less, I have managed to get a few jobs done at the allotment. 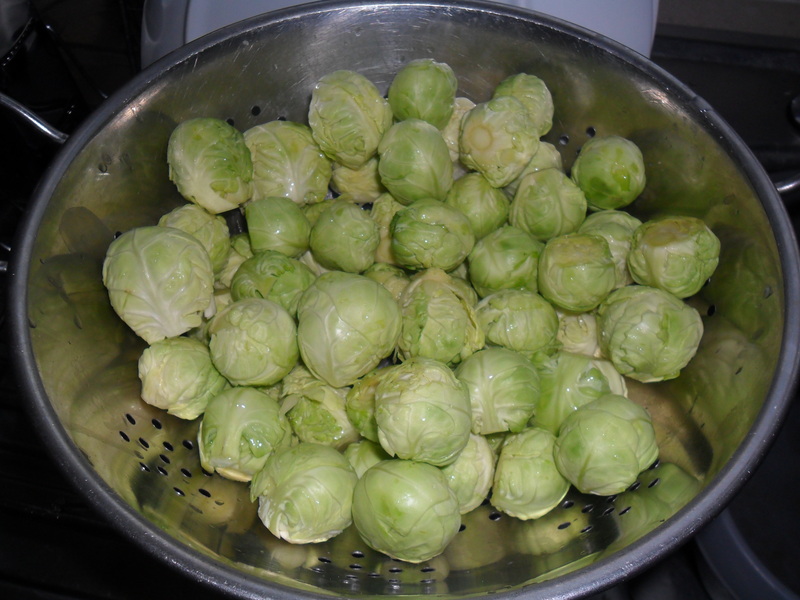 This week, I managed to pick the last of my Brussels. I cleared the bed and forked it over. 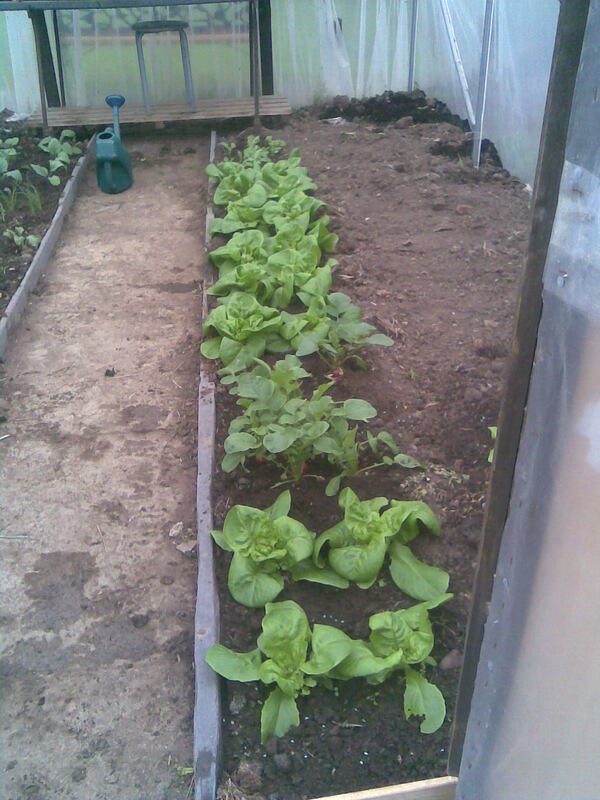 I was very pleased with my Brussels this year, as I only had one plant out of ten, that had ‘blown’ sprouts on. 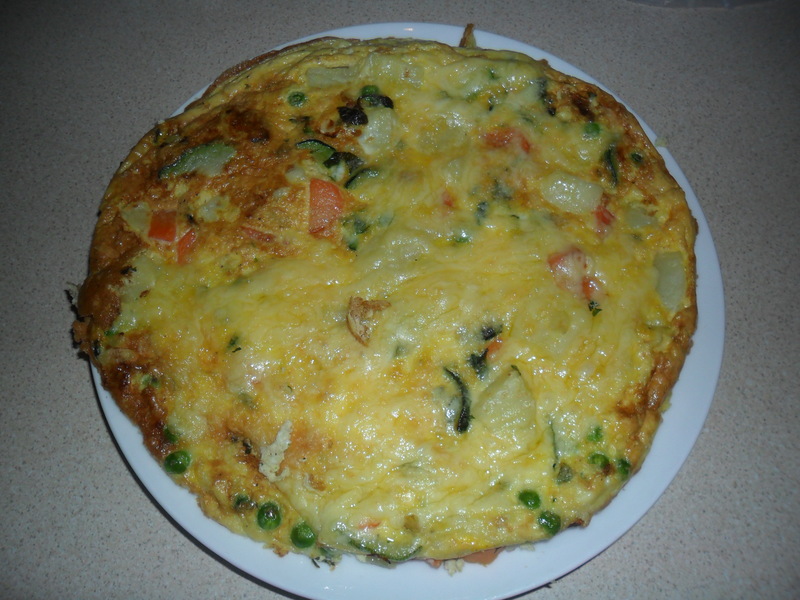 ‘Blown’ sprouts are just sprouts that have opened, they don’t look as nice, but they can still be eaten. I was always led to believe that this happens if your soil isn’t firm enough. 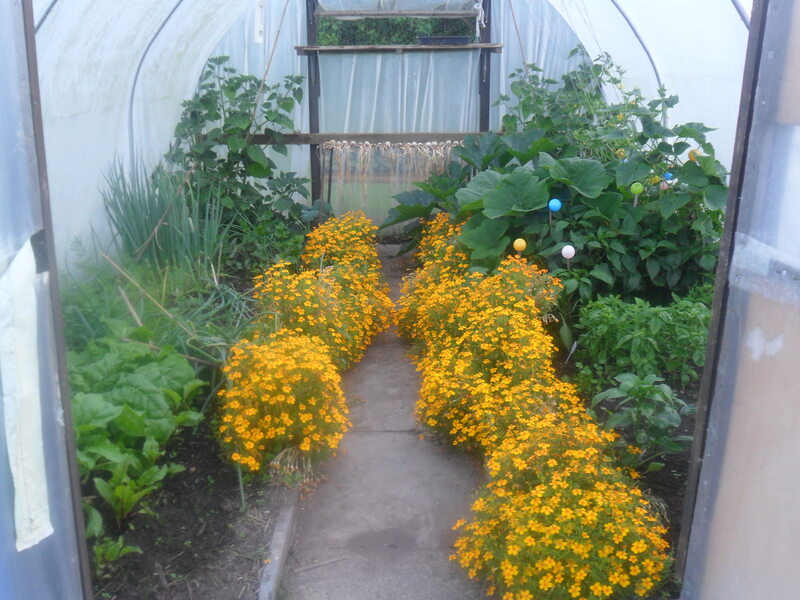 However, for the last couple of years I have dug the soil in autumn, danced and jumped on the soil around my plants and still they have ‘blown’. Last year I decided to buy an F1 variety that apparently were less prone to ‘blowing’ and I’m very pleased to say, it worked. 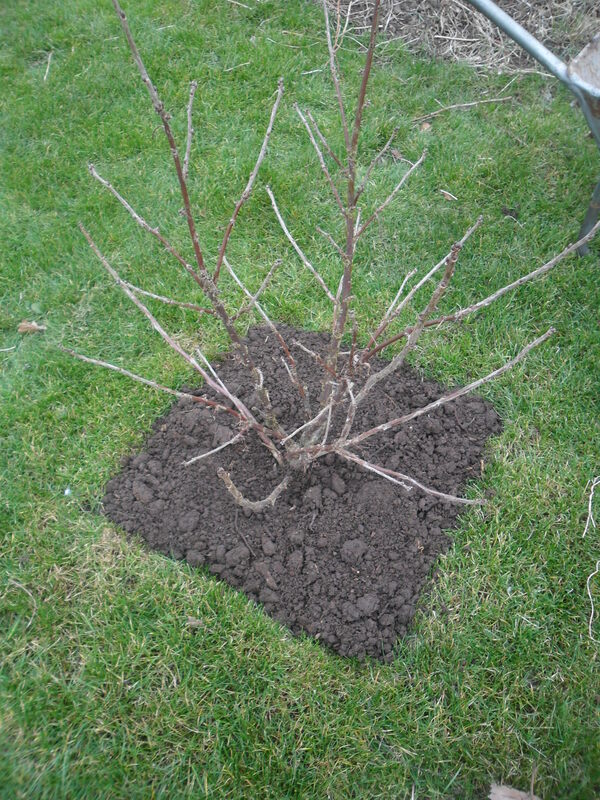 This week, I also managed to edge the other side of my summer raspberries with ‘lawn edging’ from Wilkinson’s. 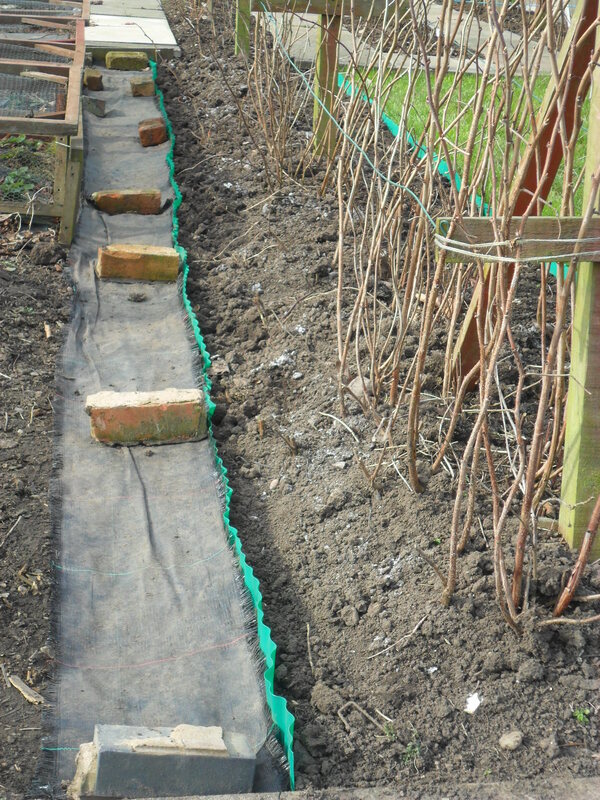 It looks neater now and I’m hoping it will stop the fox from pushing the soil onto the path next to it. 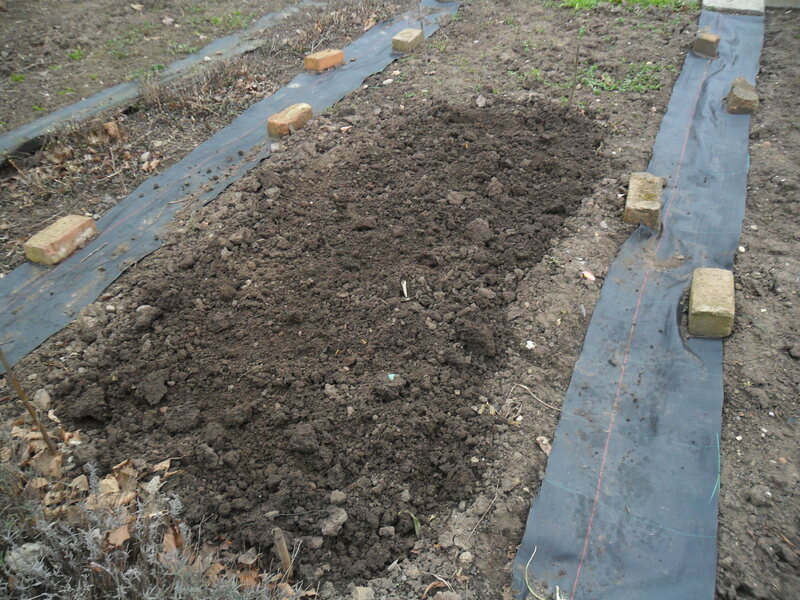 Another job I managed to do, was rake some blood, fish and bone into the soil, ready to plant my shallots and onions sets, in a couple of weeks. 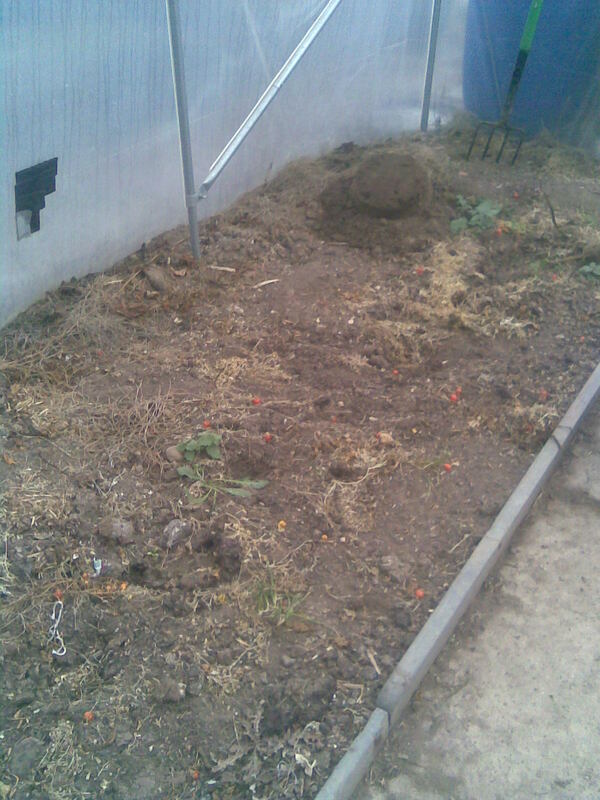 Afterwards I re-covered the soil with plastic to keep the soil warm. 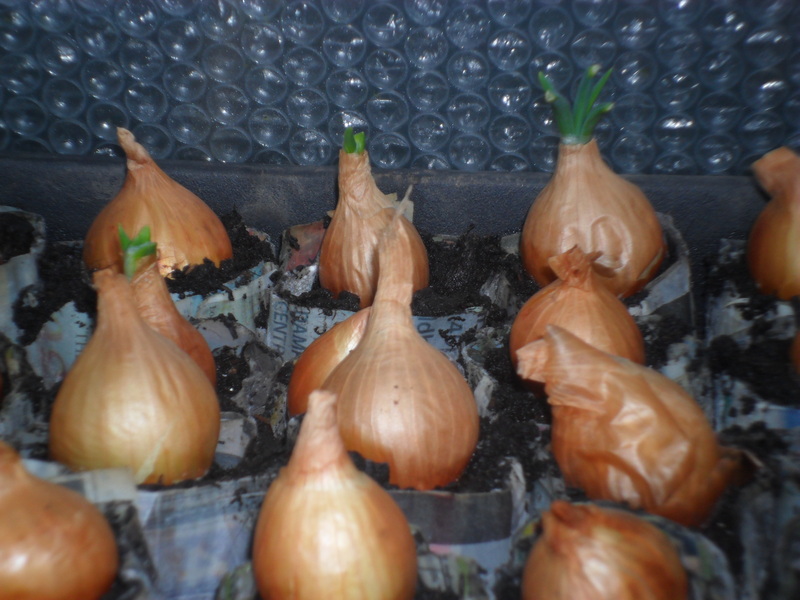 My shallots are still sitting in pots in my cold greenhouse at the moment. 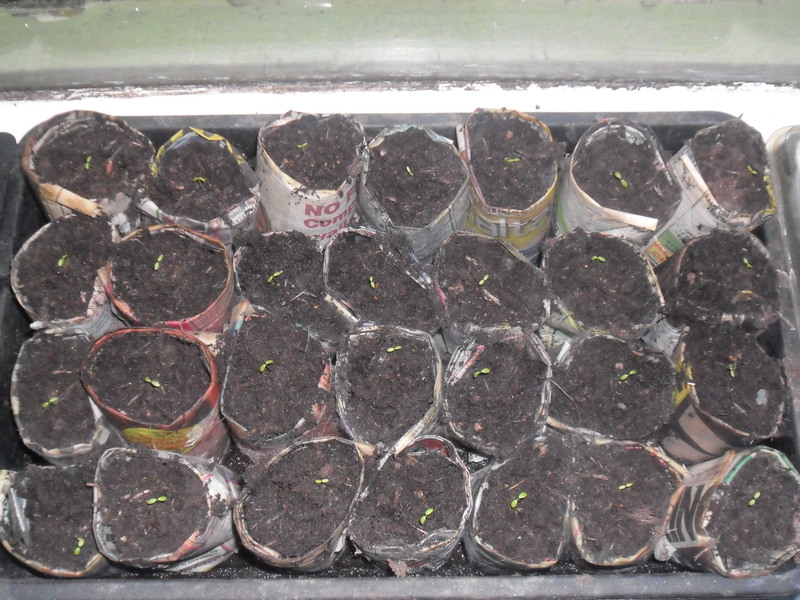 Finally, this week I noticed my spring broccoli is beginning to sprout. My youngest daughter will be pleased as she loves it. 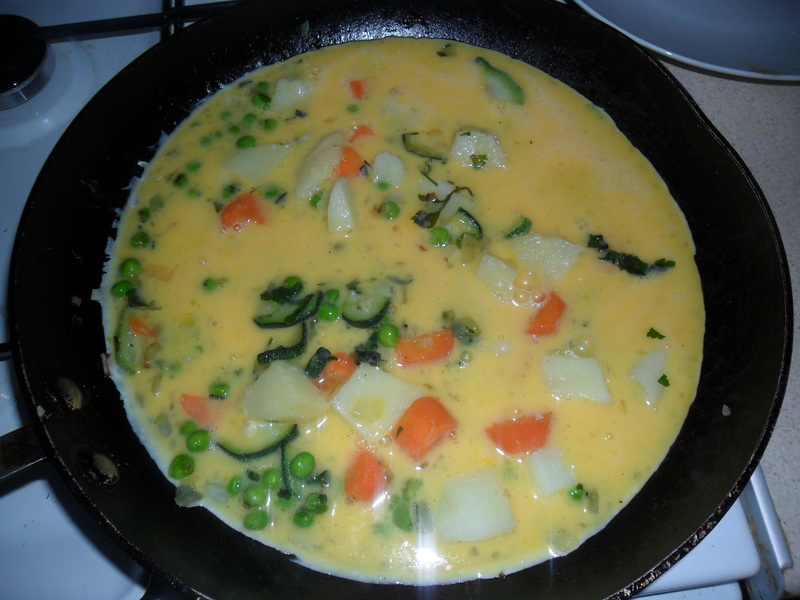 On Mother’s day last Sunday, I decided to have my favourite meal, instead of our usual ‘Sunday roast’. 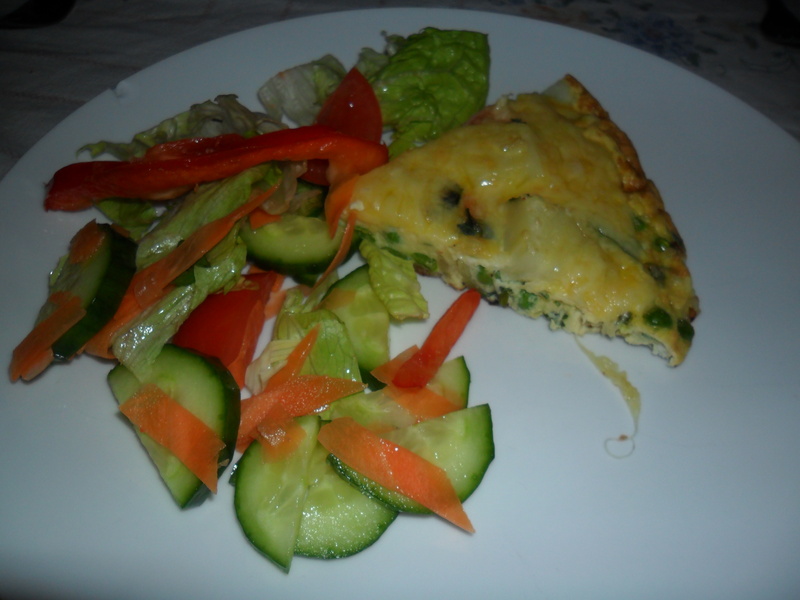 I chose to have a homemade pizza, jacket potatoes, salad and homemade coleslaw. 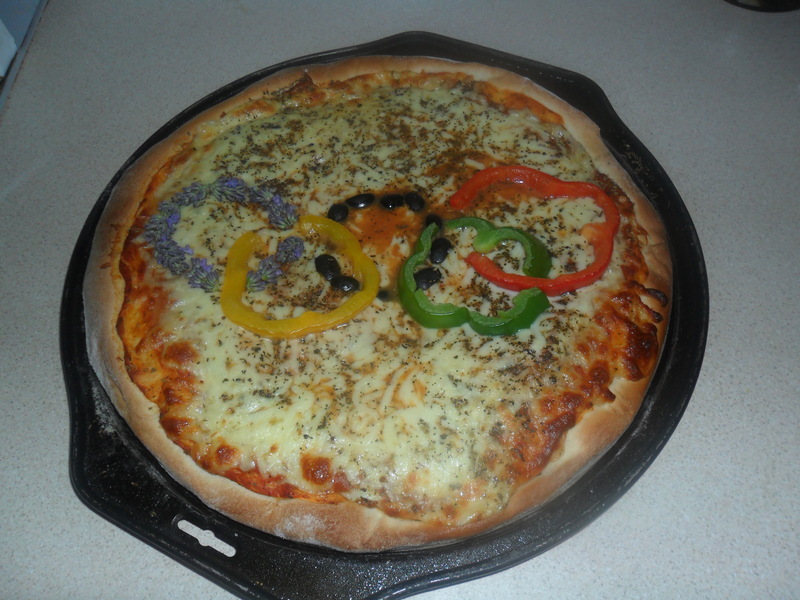 You can see how I make homemade pizza here. 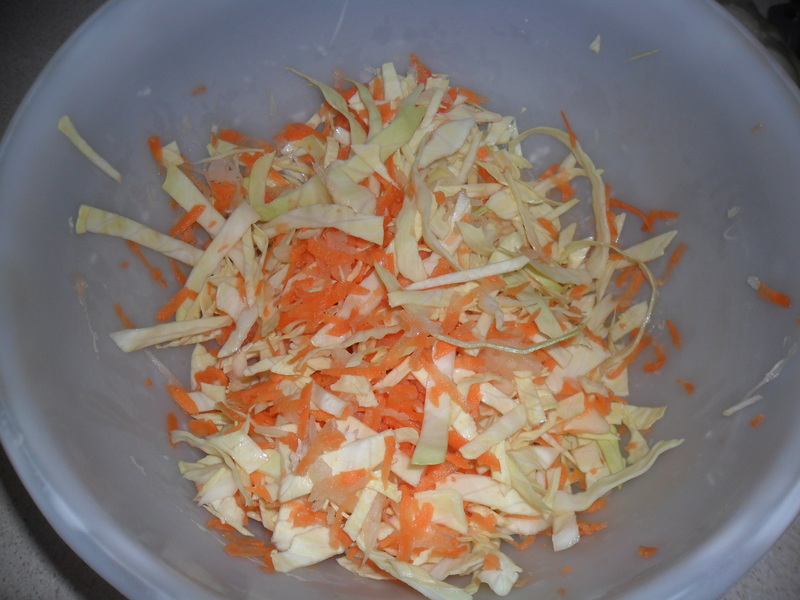 Mix the cabbage, carrots and onions together in a bowl. 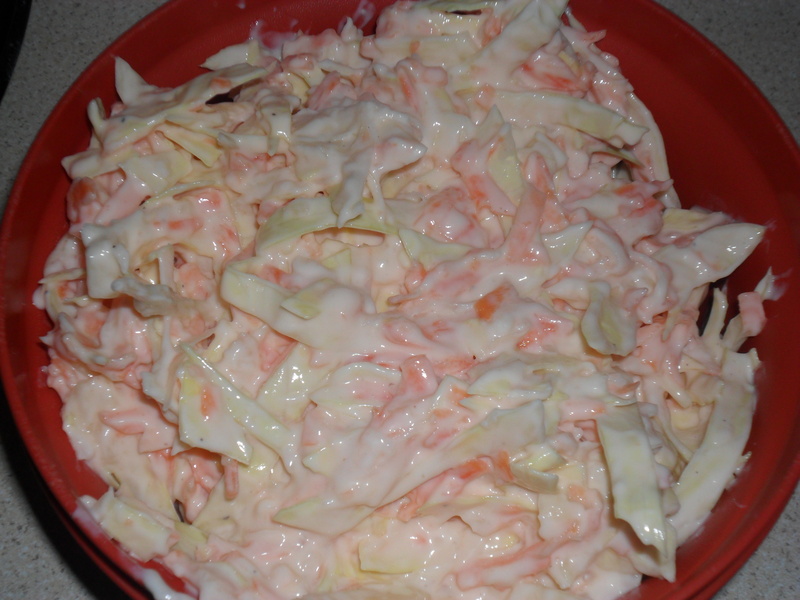 Enjoy your lovely homemade coleslaw! 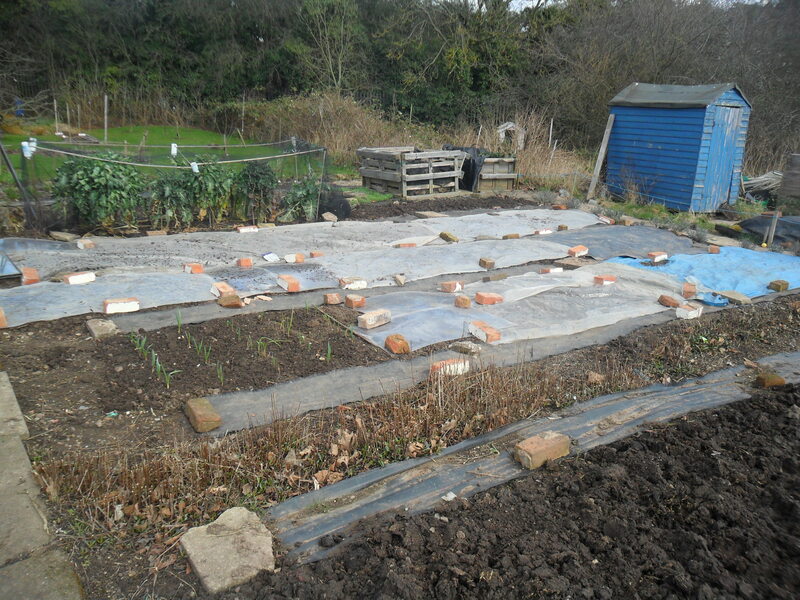 Homemade ‘Wraps’, Laundry Liquid, The Allium Leaf Miner And Seed Sowing Continued. 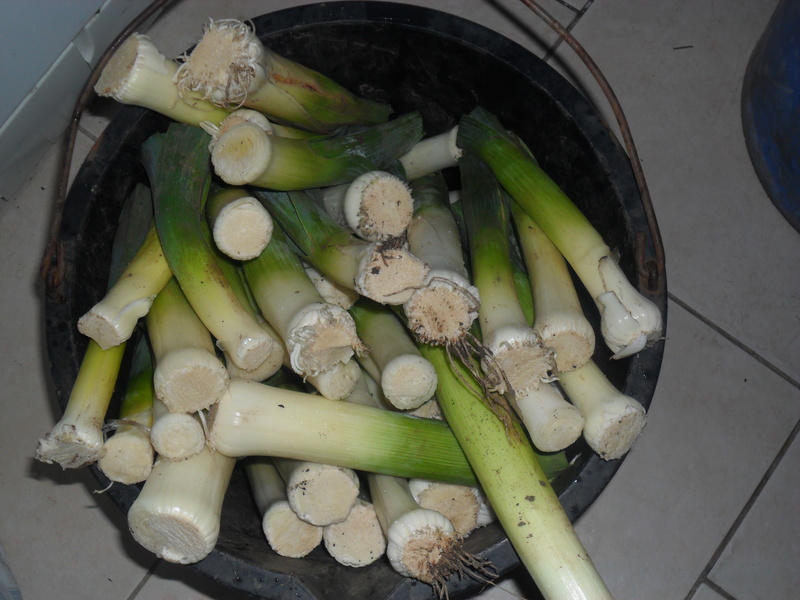 If you read my blog on Friday, you will know that last week, I dug up my remaining leeks and froze then. While I was preparing them, I found something interesting that I thought I would share with you. I found an Allium Leaf Miner, so I took a photograph to show you. 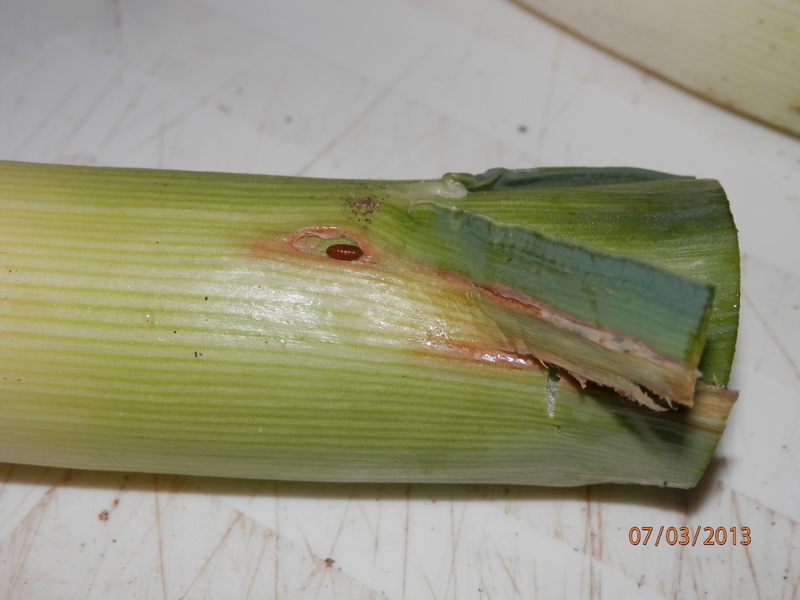 Plants affected by the allium leaf miner tend to rot, from the damage it has caused on the plant. If you look closely on the picture above, you can see the small brown pupae, 3-4 mm long, embedded in the stem. This is a pest that was only detected in Britain in 2002. It has been spreading rapidly since and spread to many places in the Midlands for the first time two years ago. 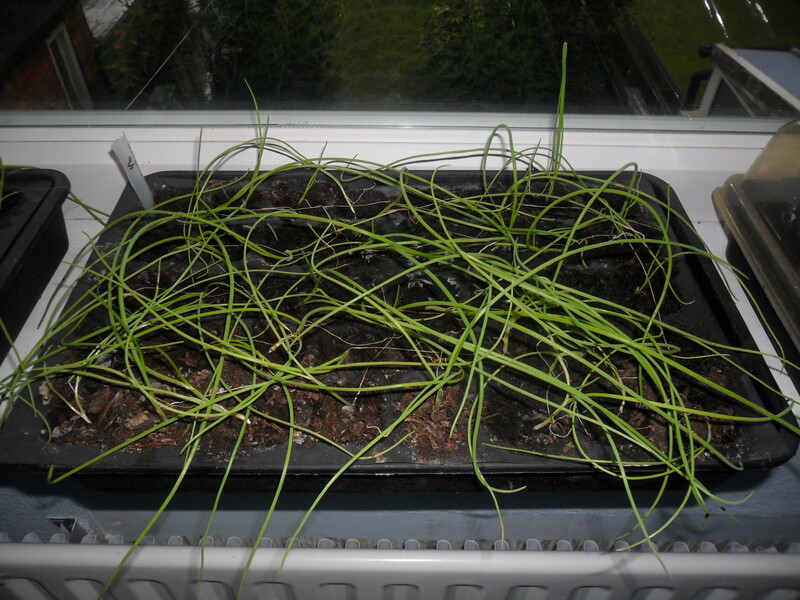 Last year I lost quite a few of my overwintering onions to the Allium Leaf Miner, so this year I covered them in environmesh, though it would cost too much to cover all the alliums I grow at my allotment, so I’ll have to hope for the best. 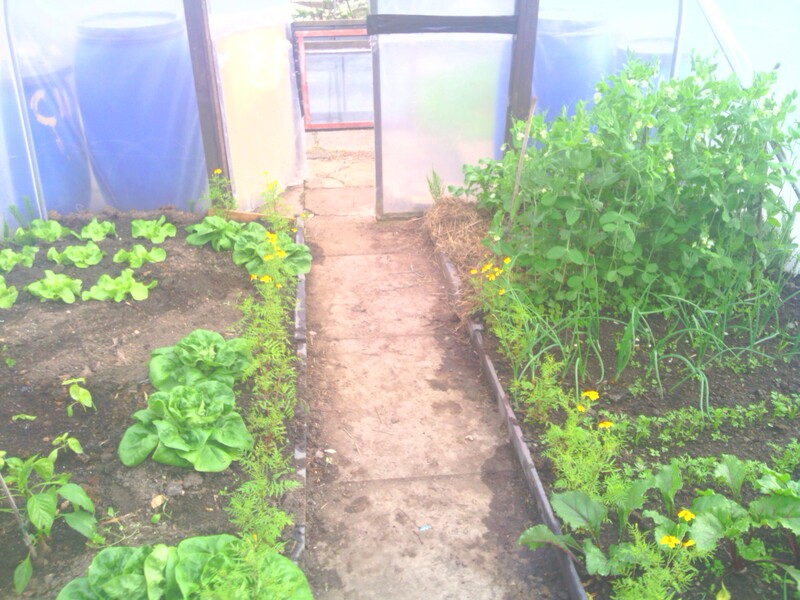 From left to right, I have Celeriac, greenhouse tomatoes, lobelia, lettuce, cabbage and cauliflowers. 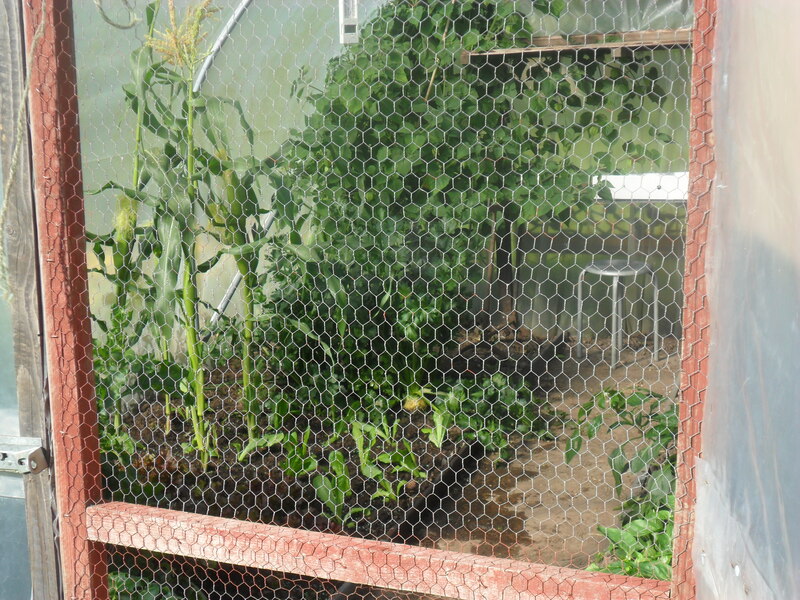 The celeriac, tomatoes and lobelia are sitting on my windowsill inside my house and the cabbages, cauliflowers and lettuce are sitting on a heated mat in my cold greenhouse. 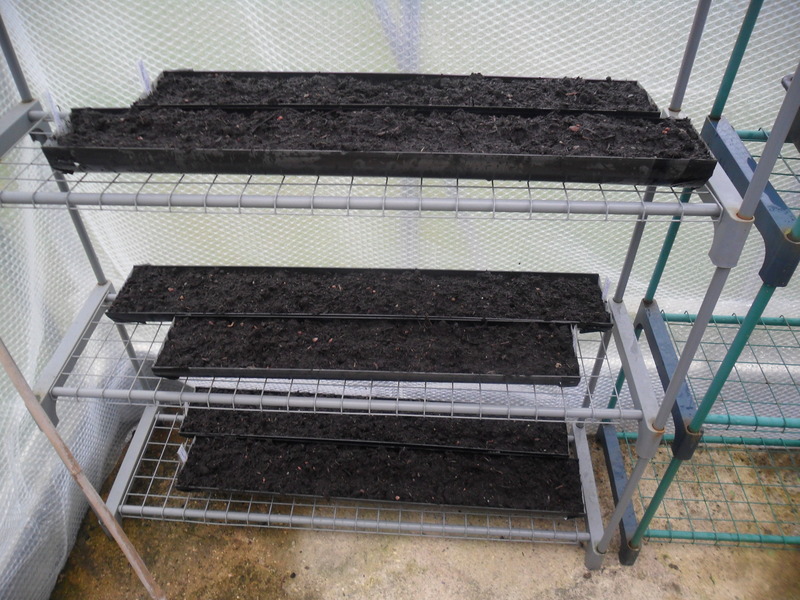 From left to right I have peppers, basil, broadbeans and onions. 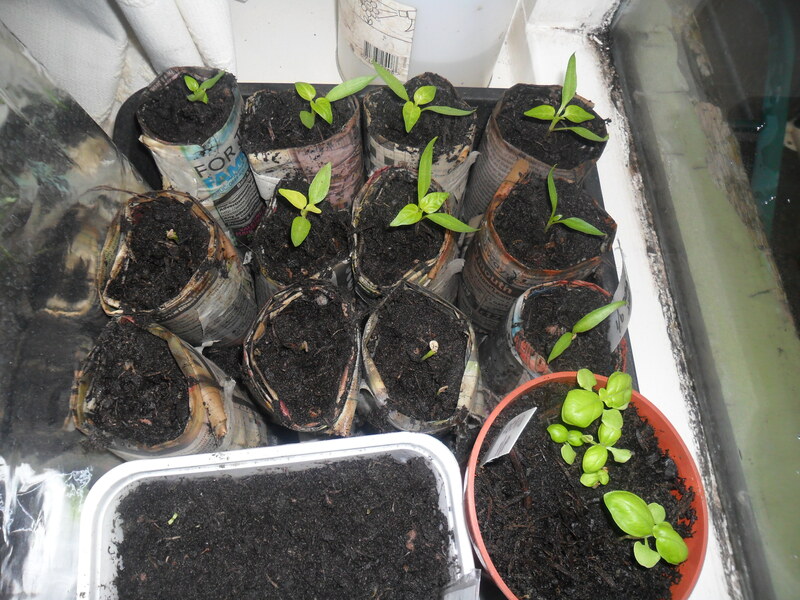 The broadbeans are in my cold greenhouse (as they are an overwintering variety), and the rest are sitting on my windowsill inside. 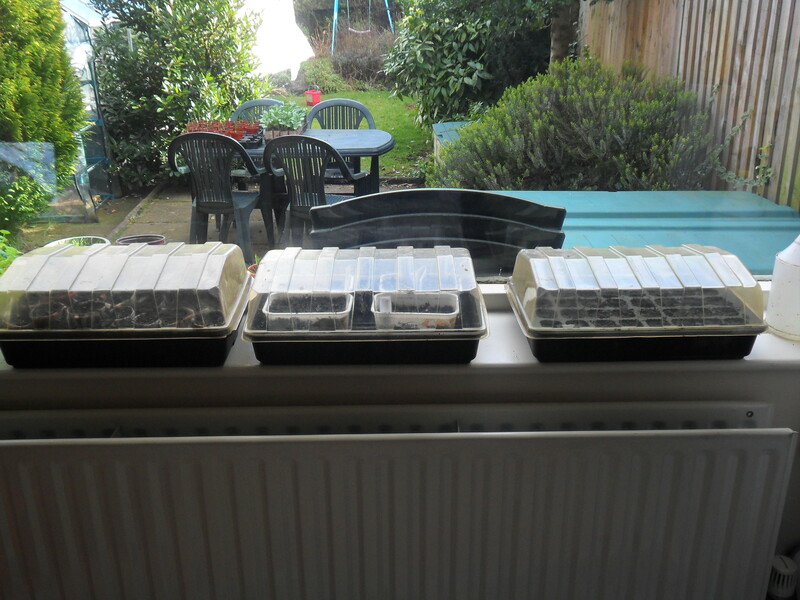 So far, my seed sowing is going well. 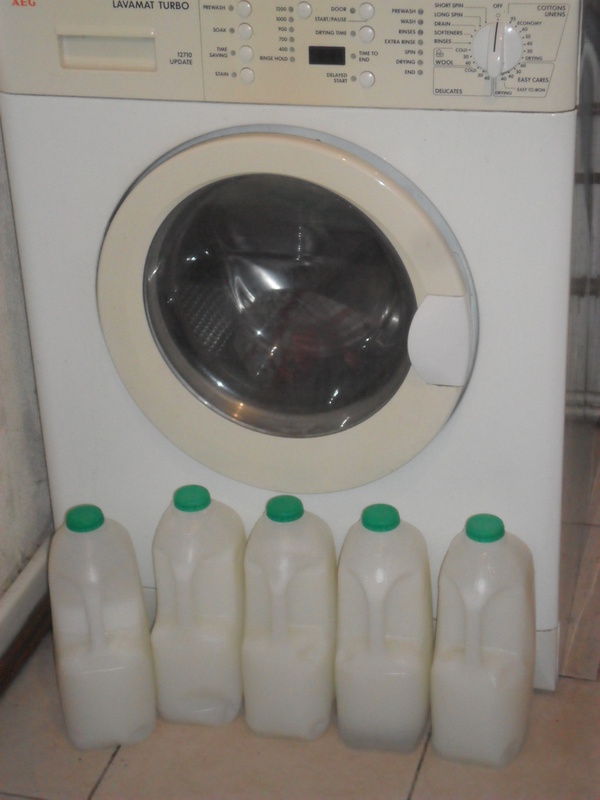 I was running short of my homemade laundry liquid this week, so I made some more. 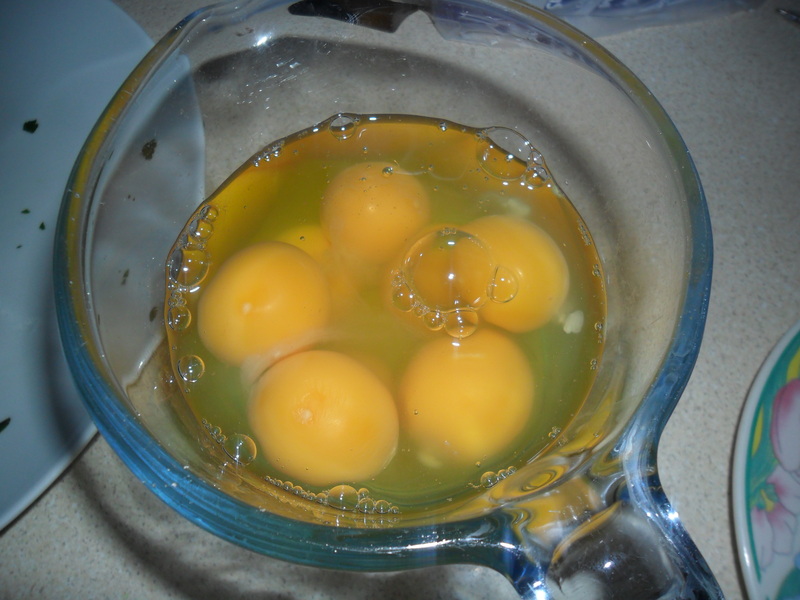 I love this liquid as it saves us so much money and it is really easy to make. You can read how to make it here. 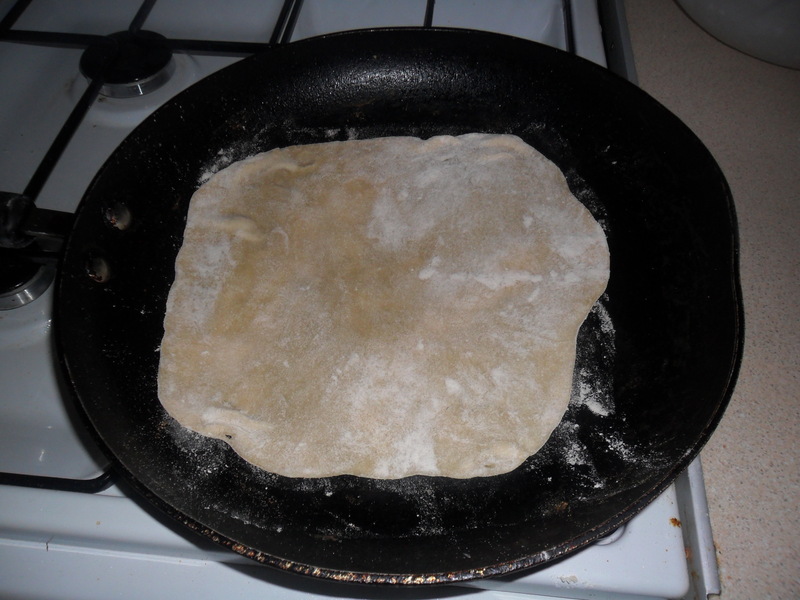 Today I thought I’d show you how I make homemade ‘Wraps’. 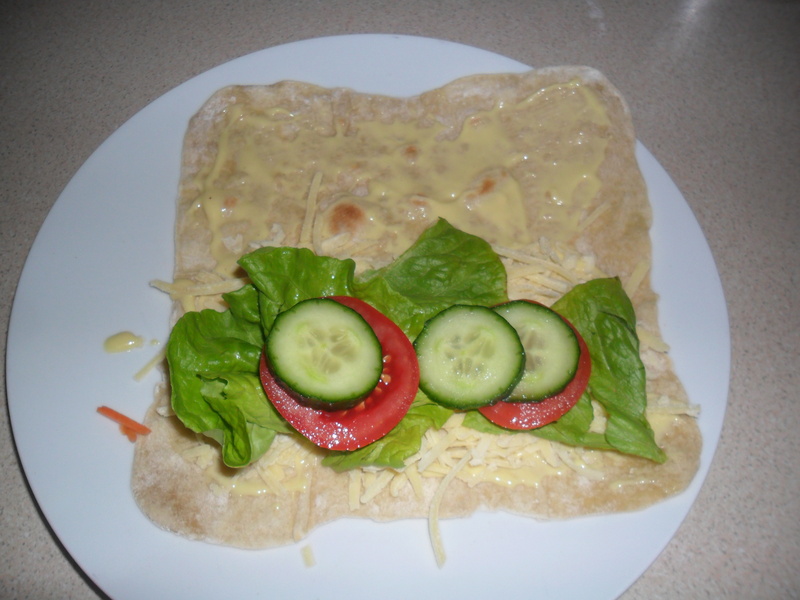 Homemade wraps are brilliant as they are so so easy to make and I have worked out that they cost just 15 pence to make…this is just under an incredible 2 pence per wrap! 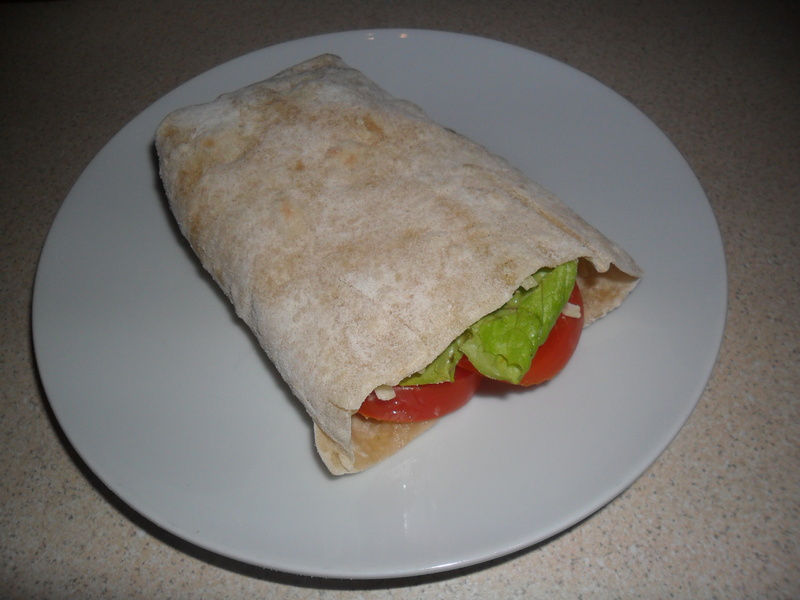 The cheapest wraps I have managed to find are currently 12.6 pence per wrap, so it’s definitely cheaper to make them. 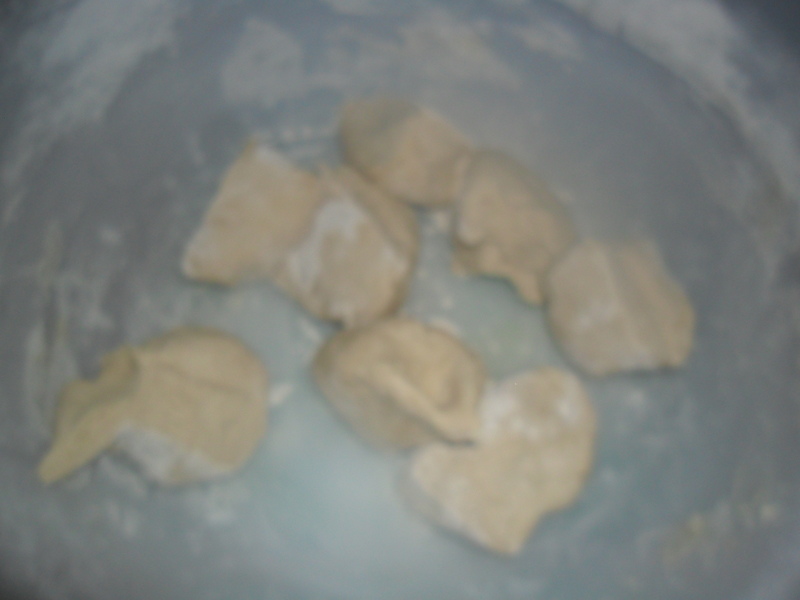 In a separate jug, add the olive oil to the warm water, then add this mix to the sieved flour and stir well until it all comes together into a ball. Knead the ball for approximately 5 minutes. 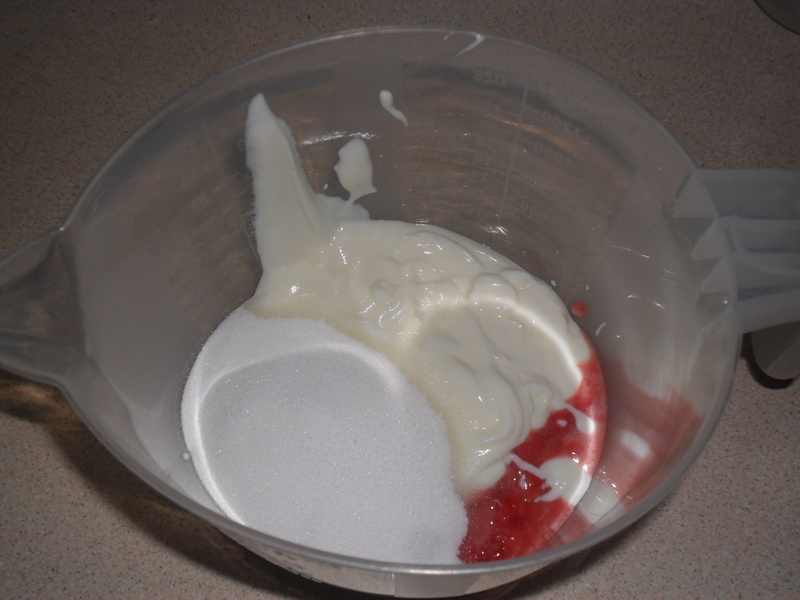 Add a little bit extra flour if the ball is too sticky. 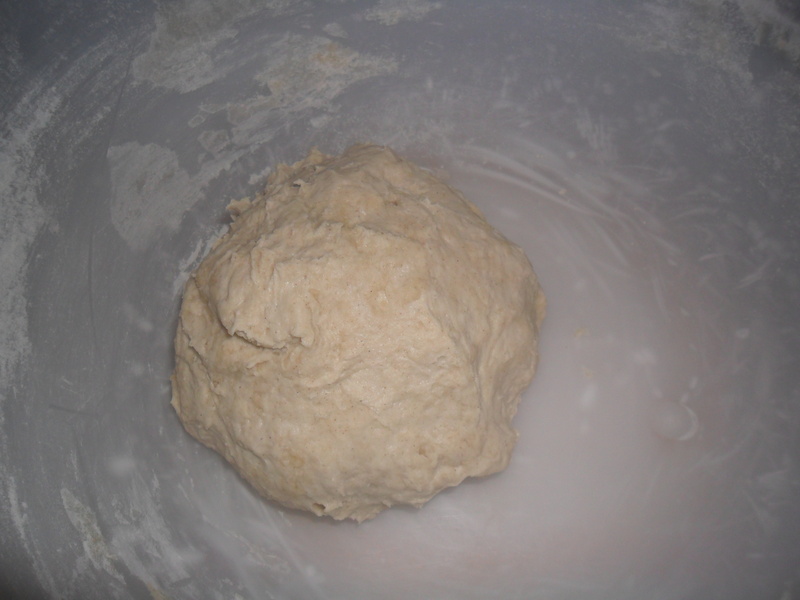 Divide your dough ball into 8 pieces. 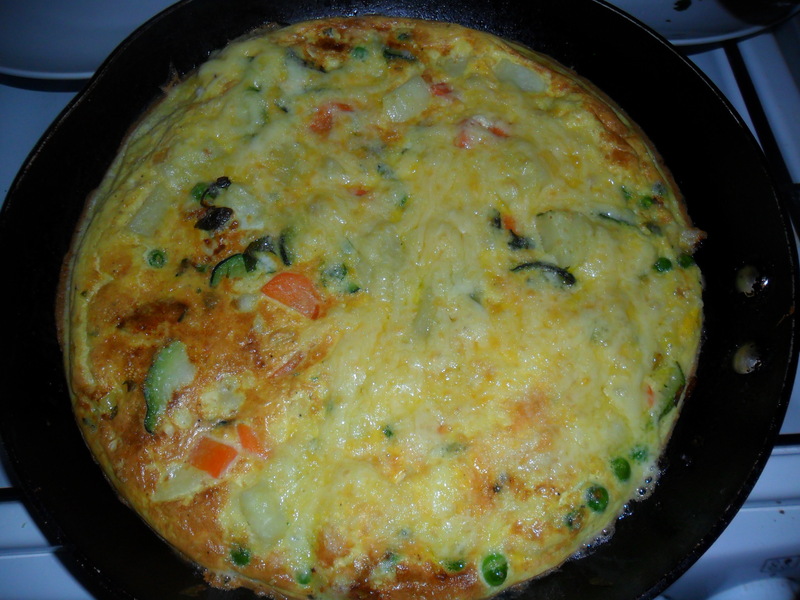 Heat a frying pan until it is very hot and then turn down to a medium heat. 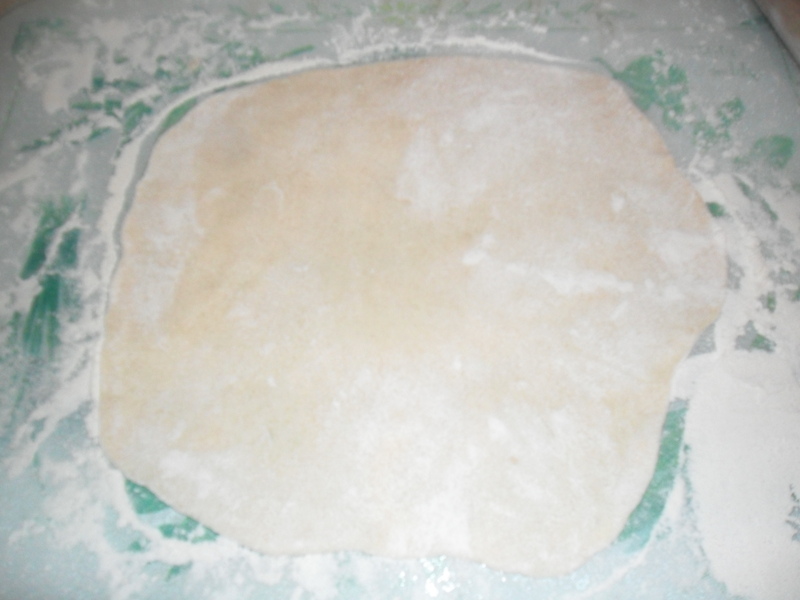 While the pan is heating, sprinkle some flour onto your work surface and roll out a dough ball into a rough circle shape. Put into the frying pan (with no oil) and cook for approximately 1 minute, then turn and cook for a further minute on the other side. 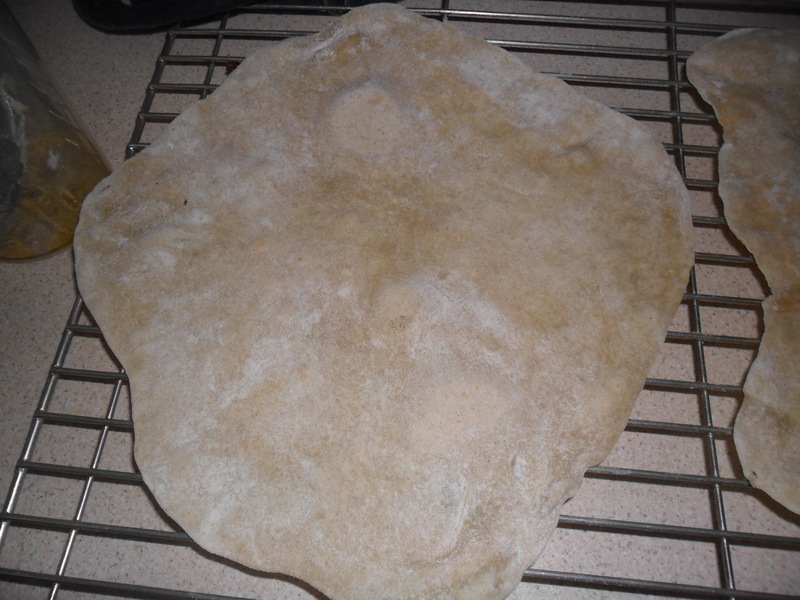 (Be careful not to overcook or the wraps will break when you fold them). 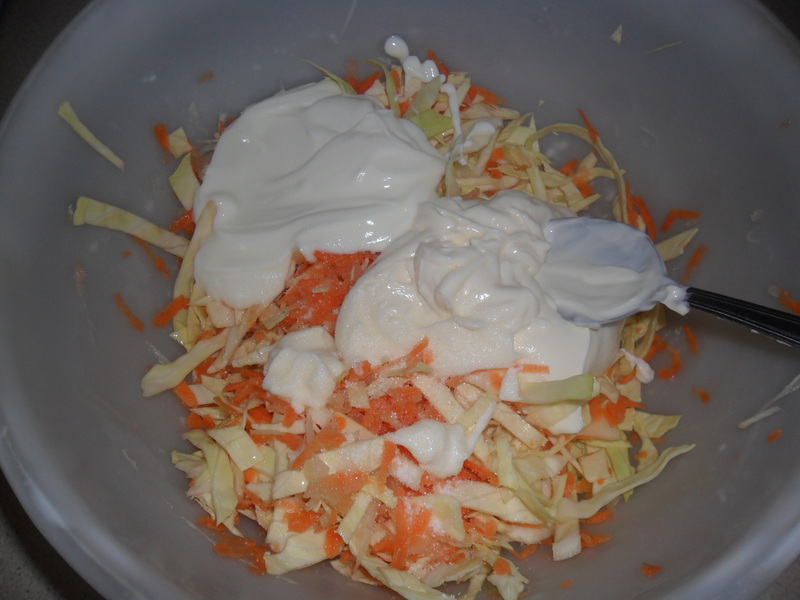 (in the picture I used mayonnaise, cheese and salad, but you can put whatever you normally put in your sandwiches). 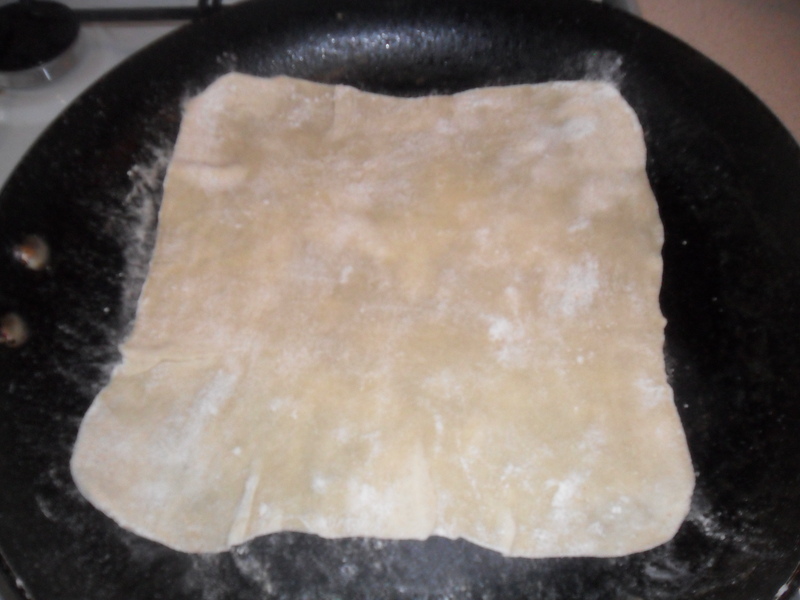 Fold the left side over the right side and turn the wrap over. 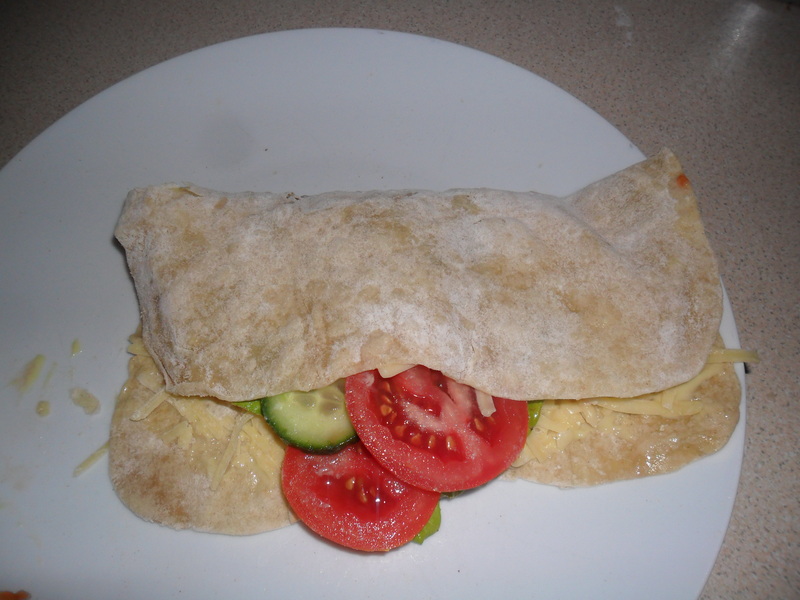 Then you have a perfect, homemade wrap…..Enjoy!